The latest Pokemon TCG set, Forbidden Light has released and that means that it’s review time. Like many of the May sets of the past few years, Forbidden Light looks to be loaded with impact cards that will shake up the meta for the final stretch of the season. This set includes 8 Pokemon GX, 6 Ultra Beasts, 5 Prism Star cards, 2 Special Energy. The set introduces into the format some powerful support for Ultra Beast cards allowing players to craft strategies around Ultra Beasts as a class of cards. For this set review, one small change I’ve made is that I’m going to avoid scoring pre-evolution Pokemon that aren’t able to played independent of the evolved Pokemon. These cards are definitely worth reviewing and talking about, but some cards like Exeggcute, which we will start the review off with, have no strength whatsoever if played on its own, but in the context of an Exeggutor deck, it could potentially provide greater value for a deck relative to other Exeggcute, so the card is still a good card, from a certain point of view. 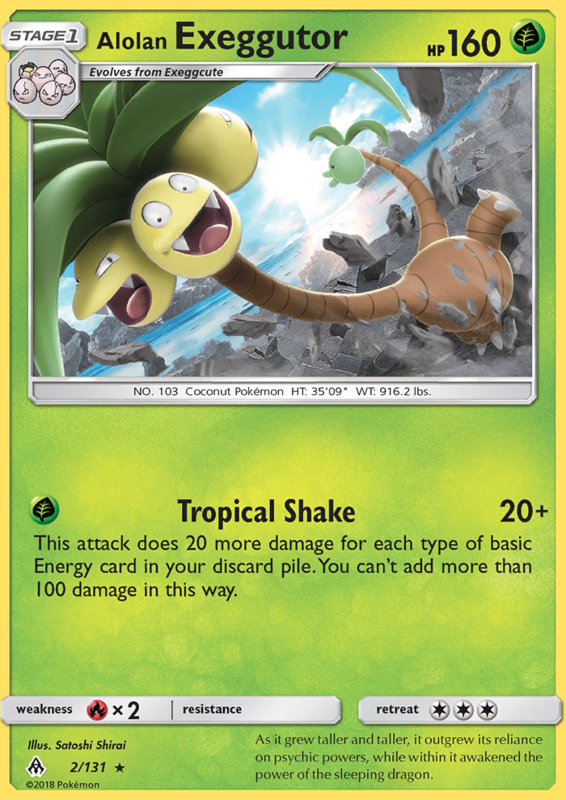 This Exeggcute will probably be the go to Exeggcute for any Exeggutor deck in Standard, or more accurately any Alolan Exeggutor deck as there isn’t any Standard Legal regular Exeggutor right now. Being able to get more Exeggcute into play with Multiply will improve the setup consistency of these decks. 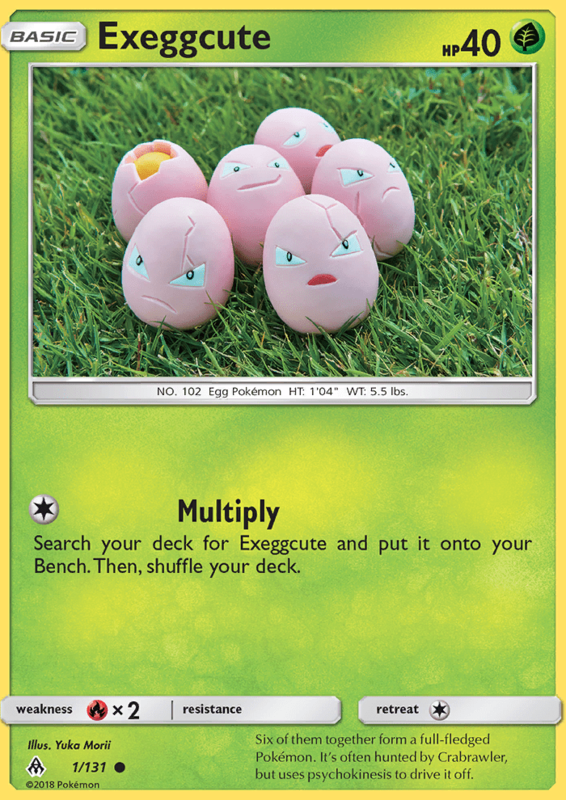 In Expanded, Exeggcute PLF is still the best Exeggcute card. Tropical Shake has the potential to be a very strong single Energy attack. If you maximize your damage output from the cards effect, you get all the way up to 120 damage. From there, Choice Band gets you up to 150 damage, all for a single Energy, which is very efficient. With a high 160 HP for a Stage 1 Pokemon, Alolan Exeggutor is very bulky and will be a difficult knockout for many Pokemon. Against anything that can’t OHKO it, it will easily win the prize trade. You could play it with Bodybuilding Dumbbells to really play into the bulky strategy as well. The difficulty that players will have with this is getting the Energy into the discard pile. The best way to do this in Standard is probably going to be maxing out Professors’ Letter and then using Ultra Ball and Professor Sycamore to send the Energy into the discard. What I think will decide whether this card is playable or not is going to be whether players can find an engine that gets the Energy into the discard pile quickly and consistently. In Expanded it will be very easy to get this guy going with Battle Compressor (which also combos well with Exeggcute PLF for Propogate), but this card is too easy to knock out against the more powerful Expanded cards, so I don’t think it has quite as much potential in that format as it does in Standard. 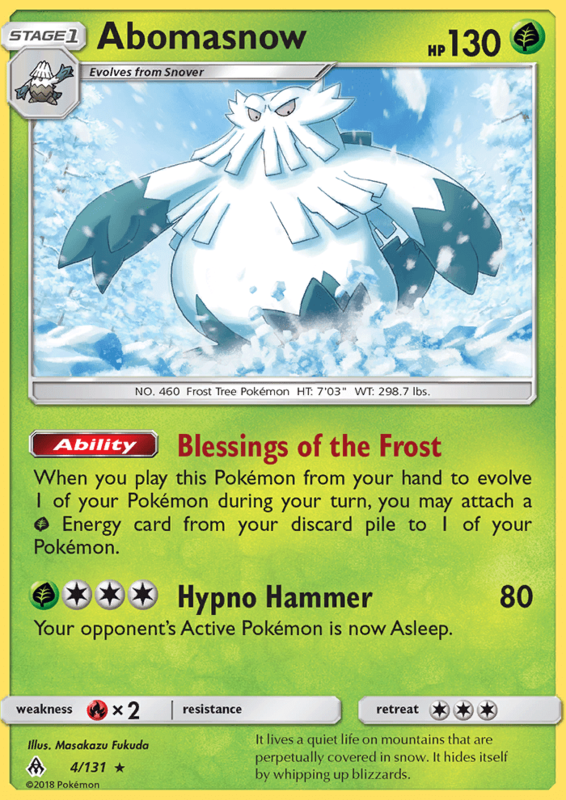 While the Blessings of the Frost Ability might have been good in some previous formats, it is far outclassed by too many other forms of Energy acceleration that it’s hard to see a strong strategy emerging from this card. Just in this own set we have Malamar. Why would you want to play a deck built around Abomasnow and a one time use Ability when you can play a Malamar deck and accelerate multiple Energy every single turn? Of course, it might find some niche use among Grass decks, but in general, Venusaur and Vikavolt already provide what look to be better forms of accelerating Grass Energy. The Abnormal Outbreak Ability adds some consistency for Vivillon decks when going second. I would expect the Ability to be the last thing a player does during their turn as they wouldn’t be able to evolve until the second turn. If you get two Scatterbug in play, you would be able to Rare Candy to evolve into the Vivillon and then manually evolve the other Scatterbug into Spewpa on turn 2. There probably isn’t a Vivillon worth building a deck around right now though. The best one, I think, is the BREAKthrough one with its Energy acceleration Ability, but most types are going to have better acceleration options available to them. 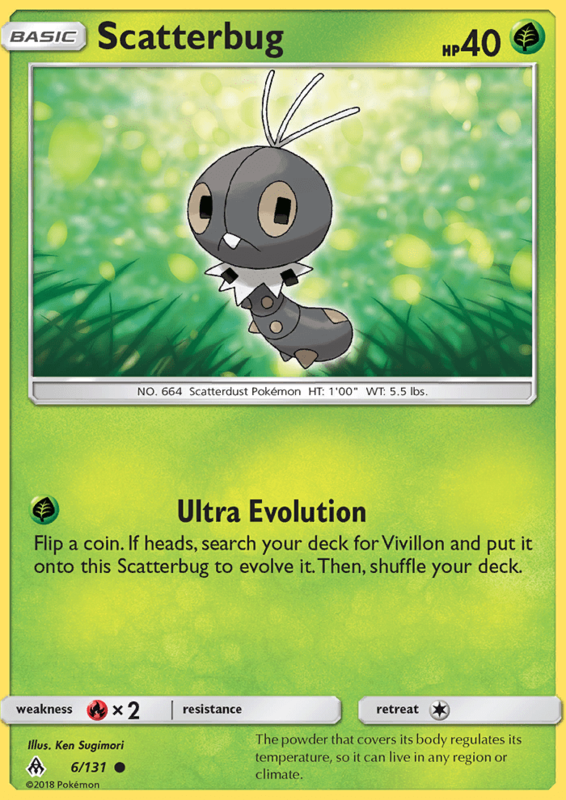 This Scatterbug also could be good as it lets you instantly evolve into a Stage 2 if you’re successful on the coin flip. This Scatterbug is only going to be useful in Vivillon decks that play Grass Energy. I think the other Scatterbug in this set is probably better as it helps you in your setup of multiple lines of Vivillon. Pheromosa gives a Grass type Ultra Beast. High Jump Kick probably isn’t much more than an attack you use if you have nothing better to do. With Beast Energy and Choice Band you could get up to 80 damage with it, but that’s not going to be a very significant amount of damage. 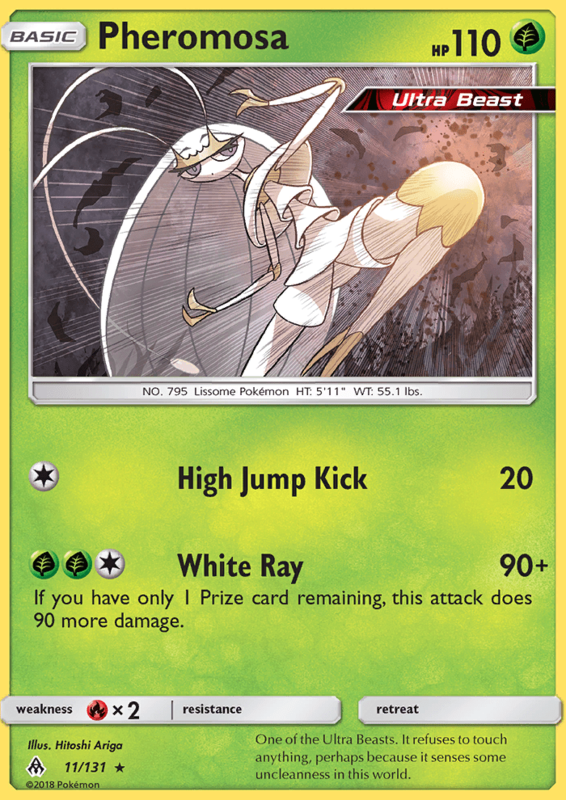 White Ray does a sufficient amount of damage for Pheromosa to be used as a type counter against Grass weak Pokemon, but the [G][G][W] attack cost is going to make it awkward to get it powered up in most decks. The effect of White Ray is also kind of awkward. Typically you want to avoid going on odd prizes if possible against GX/EX decks, so to be able to take advantage of the effect you’re likely already fell into the prize trade your opponent wanted. With that said, the effect should let you power through the last turn of the game against most decks, as you can hit up to 210 damage with a Choice Band, which will OHKO most of the popularly played Pokemon, but definitely not all of them. 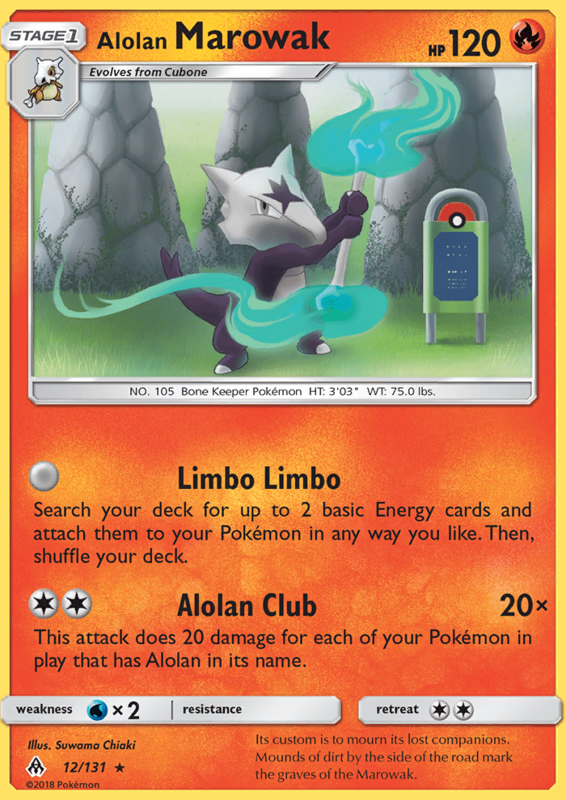 Limbo Limbo can be used as as setup attack in decks for any type. It comes with no attack cost, so you can get three Energy attached to your benched Pokemon in a single turn which could be good for setting up a variety of different strategies. The biggest drawback to Alolan Marowak is that it’s a Stage 1 Pokemon, so you won’t be able to get into it to start accelerating until the second turn of the game, but especially in games in which you go first, that shouldn’t be too big of a drawback. 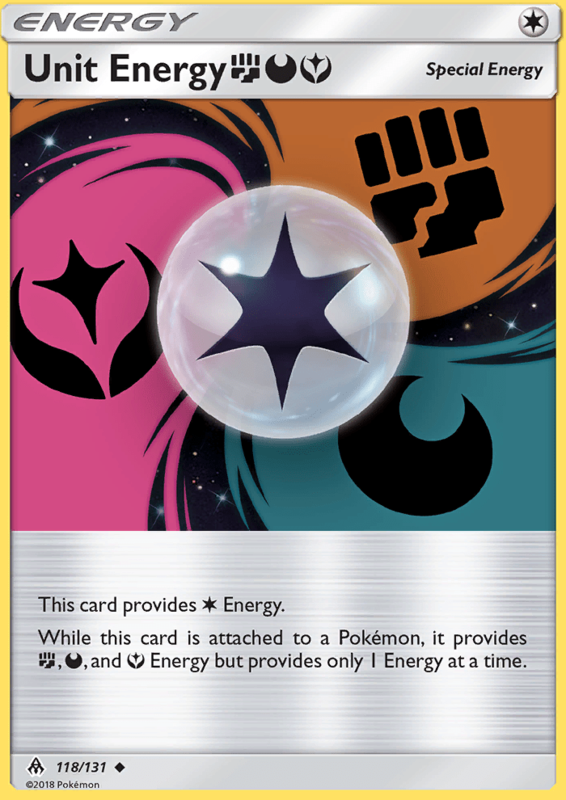 The biggest issue for the card in the format it enters is that there are so many other good ways to accelerate Energy that don’t involve using an attack. Despite this card being pretty solid in a vacuum, it might actually never be worth playing. Alolan Club could make Alolan Marowak a solid Fire type attacker in a future Alolan Pokemon deck, but as of right now, we don’t really have the Alolan Pokemon that would be needed for a proper Alolan Toolbox deck. 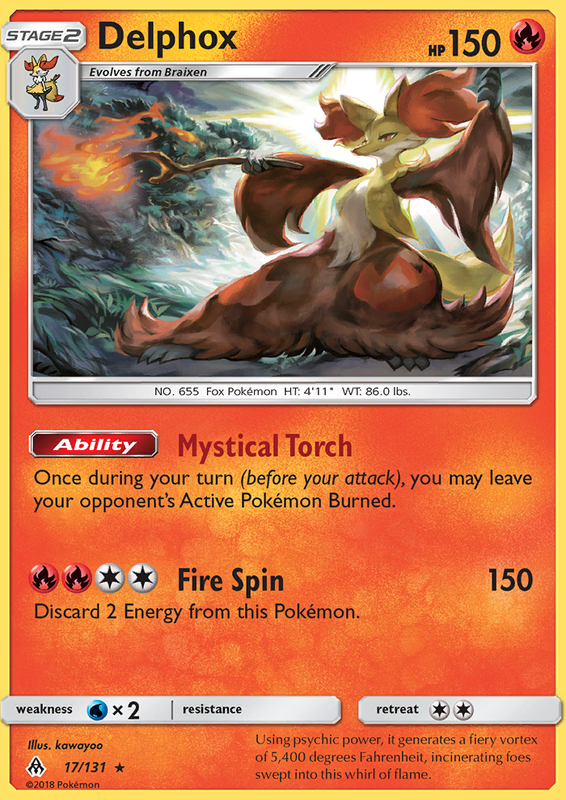 Delphox’s Mystical Torch Ability is fairly strong given the change to the Burn rules. At a minimum, every time you use Mystical Torch you will be getting at least 20 damage out of it, which is very strong. 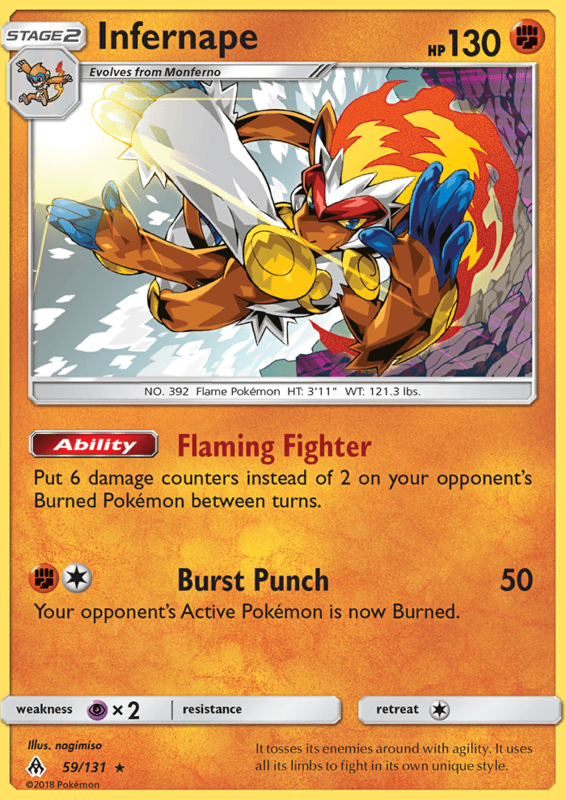 Delphox can also be used to get the Burn effect into play for attacks that have an effect triggered by the Burn special condition. At best, I think if Delphox sees play, it will be in a deck where you need to have Burn in play to trigger an attack effect. If you just want extra damage output, playing a Greninja GX line probably will make more sense, as you can get damage counters put into play as you evolve up through the line, and you can target down more Pokemon than just the active. The Unnerve Ability on Pyroar is very cool. With a three Energy cost, quite a bit of investment needs to go into setting up Pyroar, but it not being able to be affected by Supporter and Item cards makes it so your opponent won’t be able to target it down in most matchups before you’re ready for it to attack. On its own, this card doesn’t really stack up. Lysandre Labs needing to be in play to get the damage boost isn’t very good, as it prevents you from using Choice Band for an effect, as Lysandre Labs takes away the effects of all Tool Cards. 140 damage isn’t a very good number to be hitting. 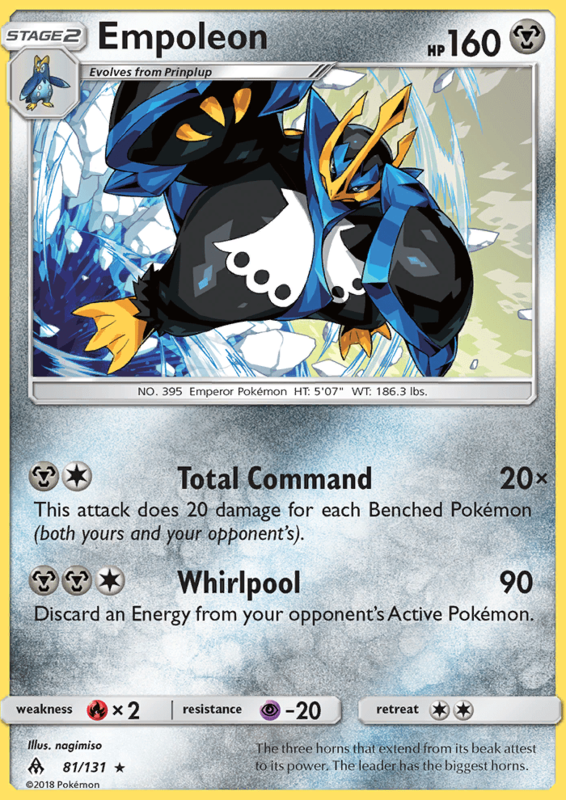 However, with Pyroar BREAK from Steam Siege, I think this card has a shot. Pyroar BREAK’s Kaiser Tackle does 180 damage, which with a Choice Band gets you up to 210 damage. 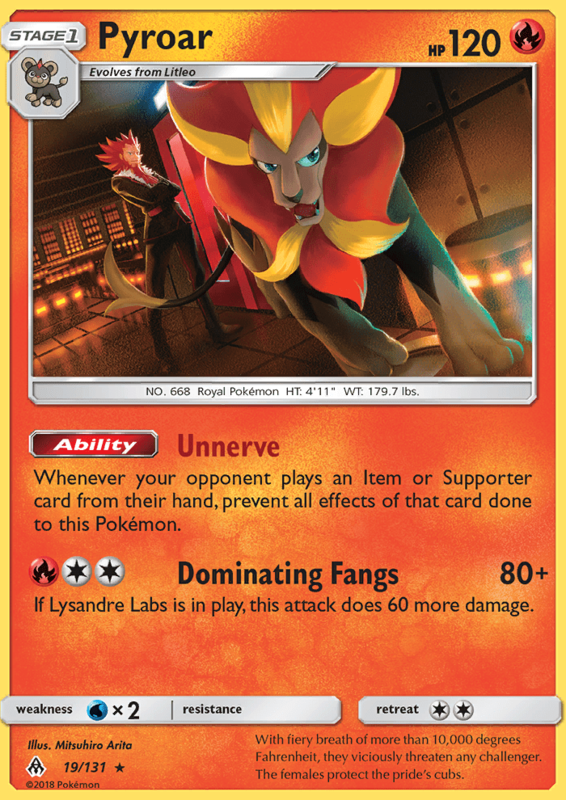 With Unnerve preventing your opponent from targeting down your Pyroar BREAKs before you can evolve them, I think there is a real chance a Pyroar BREAK deck could actually be made now. Unnerve would also let you play something like Exp Share to get your Pyroar powered up, something that you couldn’t do in the past. That would prevent you from playing Choice Band, but you could play something like Magearna to lift Tool cards to allow you to swap out an Exp Share for a Choice Band. Palkia GX is a a Water type reprint of Palkia GX from Ultra Prism. Palkia GX was originally printed as a Dragon type card, but I think it is a bit more playable now that it is Water type. Now that it is Water type, you can Aqua Patch to it, making it easier to setup. However, this is still a very flawed card. Spatial Control is an awkward attack to setup, and Zero Vanish GX costs a ton of Energy and most decks don’t play with a lot of Energy in play anyhow. Hydro Pressure is a solid attack, but nothing you can build a deck around in Standard format. 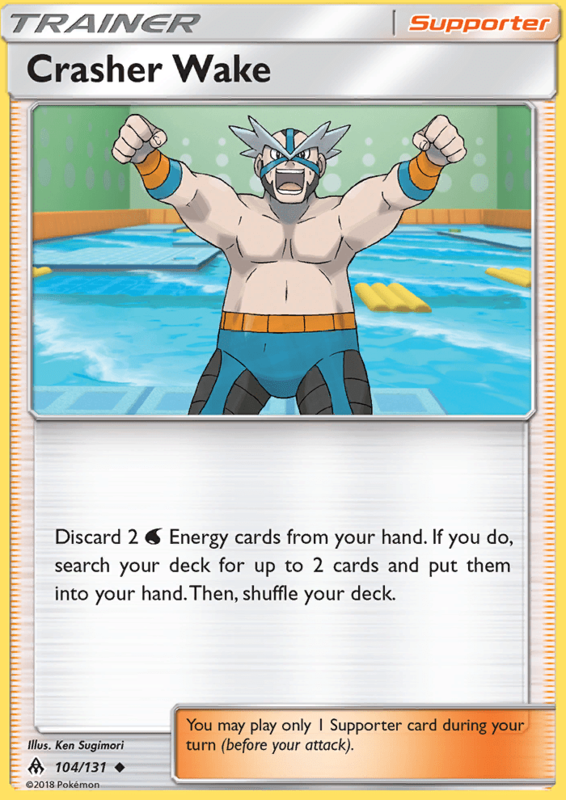 In Expanded, there is better cards to put into a Archie’s Blastoise deck as well. 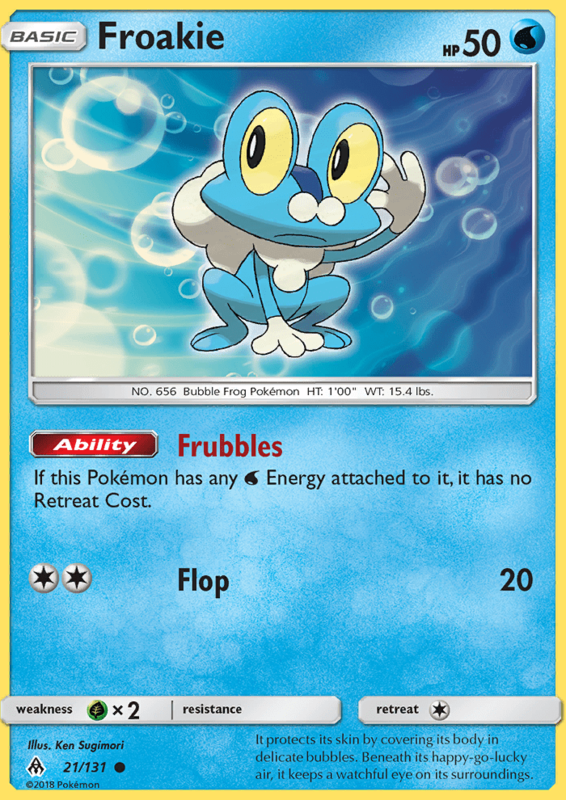 Froakie’s Frubbles Ability is pretty solid if you’re building a deck that intends to use Greninja GX as an attacker. It allows you to attach a Water Energy to Froakie when you start it on turn 1 and then retreat into a setup Pokemon, such as Alolan Vulpix, helping you get setup easier. The Ability is of course worse than Zubat’s Free Flight Ability, which it will probably be unfairly compared to. 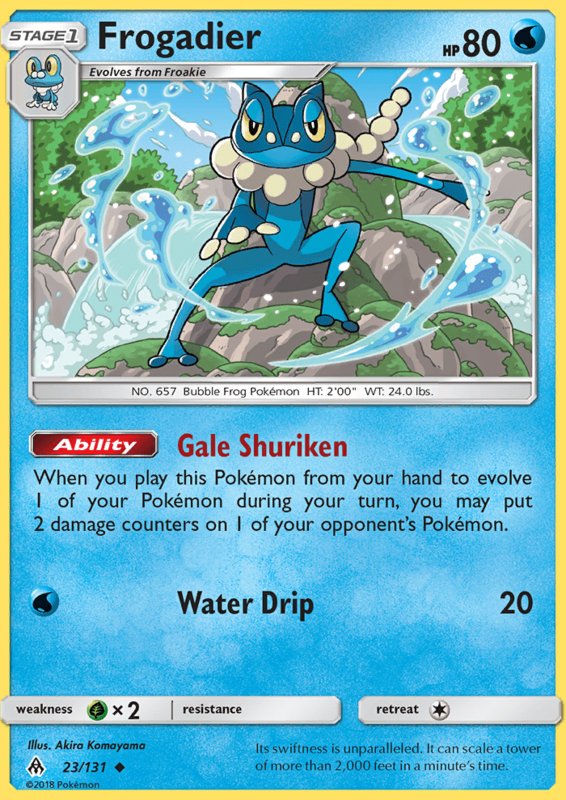 This makes Froakie a little worse than Zubat was as an opener for decks using the Greninja GX for added damage only, such as decks like LandBats and Toad Bats did in the past, but it is still a good pre-evolution and makes Greninja GX decks with Water Energy slightly better. These two cards must be discussed together as they’re part of a package. The obvious card to compare these two cards to are Golbat PHF and Crobat PHF, which had the same damage placing Abilities. Frogadier lets you place 2 damage counters on a Pokemon when you evolve into it and then Greninja GX lets you place 3 damage counters on a Pokemon when you evolve into it. Being able to get extra damage from an Ability has always been strong, so I would expect these cards to find some Pokemon to pair with to good effect such as a Pokemon that just need a little bit of a damage boost to hit for relevant numbers. Unlike the Crobat line, however, there is enough extra to Greninja GX that it is feasible to make a deck entirely based around it. Haze Slash does a solid 110 damage and will get you 2HKO’s against everything if you have a Choice Band attached for at least one of the attacks. 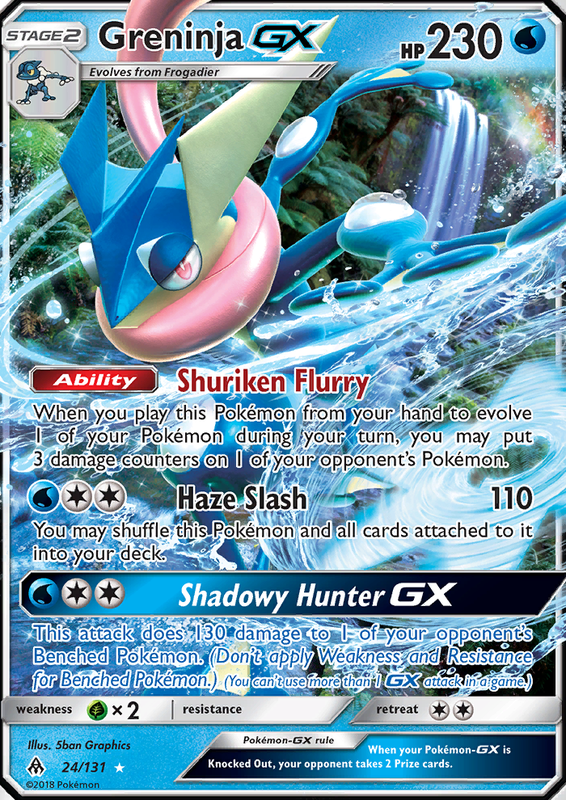 The option to shuffle Greninja GX into the deck is huge, as it gets the Greninja line back into your deck, allowing you to re-use the Abilities again, but it also lets you build a tank strategy around Greninja GX. At 230 HP, Greninja GX should have pretty good survivability in most matchups. Shadowy Hunter GX is a great GX attack as well. It gives you a snipe attack that you can use to target down a bench threat or something like a Tapu Lele GX to finish a game. A couple of Ability uses followed by Shadowy Hunter GX can get OHKO’s on Basic Pokemon GX’s pretty easily. The package of cards that work with Greninja GX also help to give it more potential. As you already play Frogadier, you can include Greninja BKP as an alternate attacker, giving you access to Shadow Stitching in any deck and Moonlight Slash in Water decks. As it is Water type, you can also use Aqua Patch to help setup Greninja GX’s attacks. 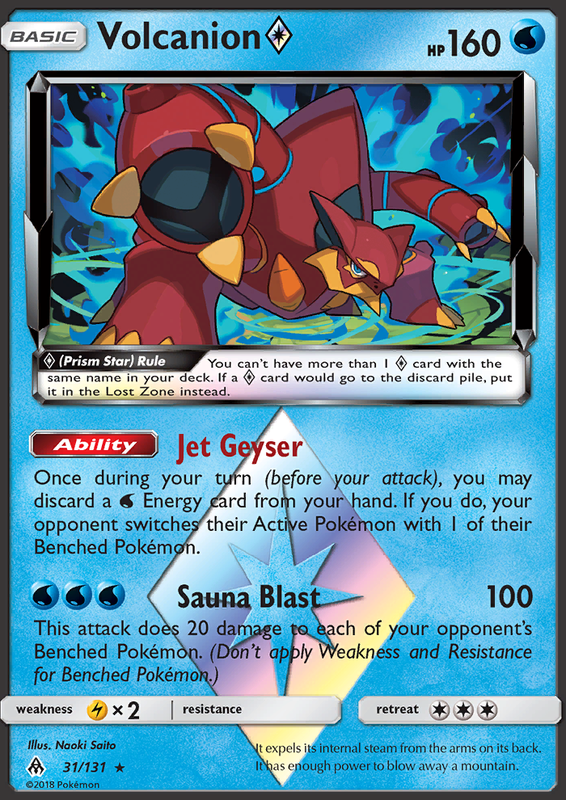 Volcanion Prism Star’s Jet Geyser Ability works very well with getting Energy into the discard pile for Aqua Patch. The effect of the Ability isn’t too strong as the opponent gets to choose what they bring up, but it can sometimes force something into the active position that your opponent doesn’t want there. Especially early game, when benches are smaller, it becomes more likely for you to be able to bring something good up. Sauna Blast is a pretty costly attack, but since Volcanion has 160 HP, it usually take two attacks to be knocked out, which helps you get more value out of those three Energy attachments than you typically would. Water type also has Aqua Patch to accelerate to it, so it’s easier to set Volcanion up than it would be an attacker from most other types. The 20 damage spread from Sauna Blast can be very useful in a Water deck. For example, the 20 damage spread makes it immensely easier for Lapras GX to hit its knockout numbers, as it is maxed out at 190 damage. The 20 spread from Sauna Blast can help you take down a Pokemon like Zoroark GX with its 210 HP. Araquanid’s two attacks combo very well damage wise. Bubble with a Choice Band followed up by Bubble Trap with a Choice Band does a total 210 damage. 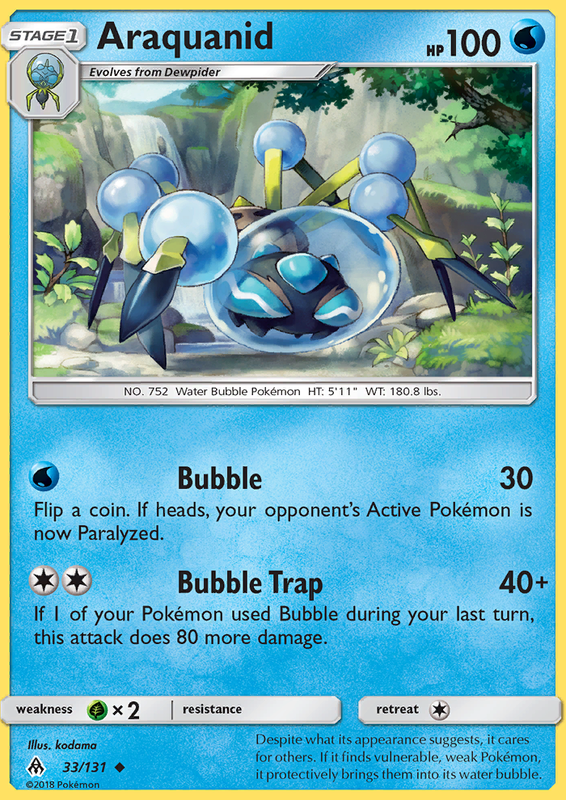 I especially like that Bubble Trap just needs any Pokemon to have used Bubble during your previous turn, which means that there isn’t a way for the opponent to reset the effect, save for Pokemon Ranger. However, I don’t think this format is quite right for this type of card to succeed in. The paralyzation from Bubble is on a coin flip, so you won’t get it every time, although you could play a Fliptini to move the probabilities further into your favor. However, most smart opponent should be able to conserve their Guzma to get around the paralyzation turns. 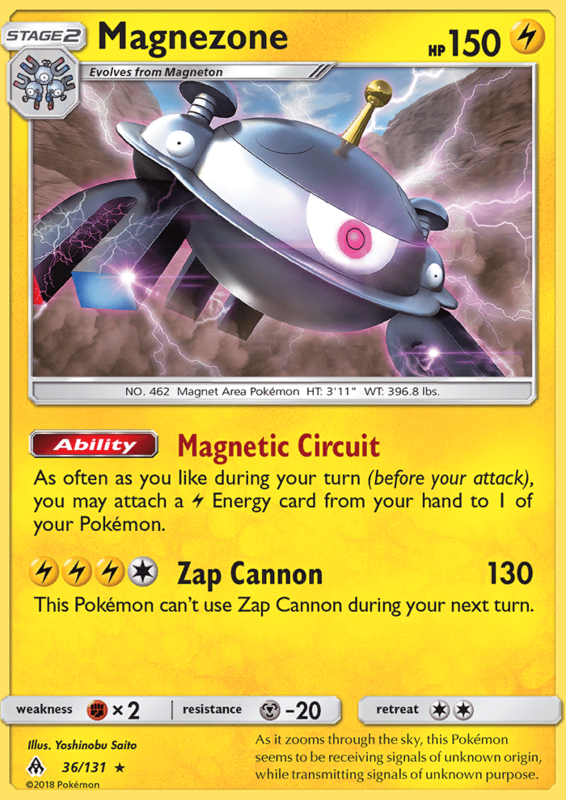 This Magnezone is a Lightning type reprint of the Magnezone from Ultra Prism. Additionally, there is already a Magnezone in format from BREAKthrough that has the same exact Ability for accelerating Energy to Lightning Pokemon. 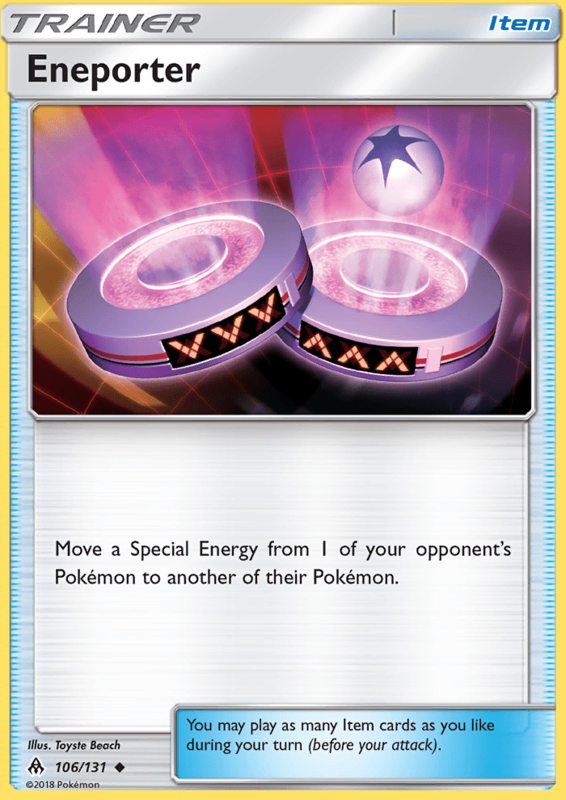 In a general sense, this Magnezone is a strong card, these acceleration Abilities tend to do well at some point. However, the Lightning type Magnezone from BREAKthrough is actually one of those cards to not find any substantial success during its lifespan. The problem with the Lightning Magnezone has always been that the Lightning type Basic Pokemon that it can accelerate to have always been trash. As of right now, I don’t believe there are the right Lightning type Pokemon to build a good Lightning Magnezone deck. However, the card is still worth picking up as the Ability is strong, but it’s going to need to see better Lightning attackers released for it to be a relevant card in the meta. Xurkitree could become the go to non-GX Lightning type attacker for decks with Lightning type acceleration. 100 damage with Cablegram fills the general damage output you’re typically looking for in these decks, being able to get 2HKO’s against GX Pokemon (with Choice Band), and being able to take some OHKO’s on smaller stuff, like pre-evolutions. The paralyzation effect is a neat effect, but probably something you rarely use with this card. You would need exactly three prizes left and be wanting to attack with Xurkitree at that point in the game to make it happen, and even then, your opponent can probaly play around the paralyzation with a Guzma. 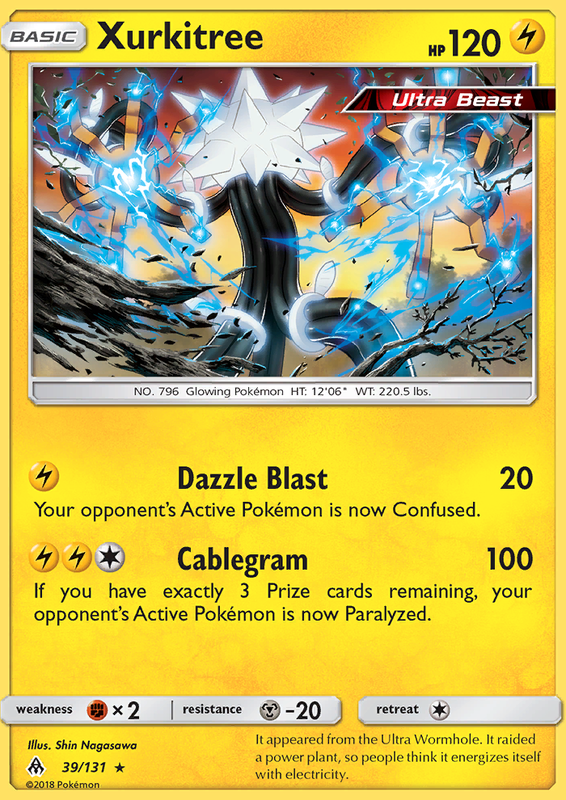 Dazzle Blast is a solid attack, giving Xurkitree a disruptive element and allowing Xurkitree to be used to place some small amounts of setup damage for a single Energy attachment. 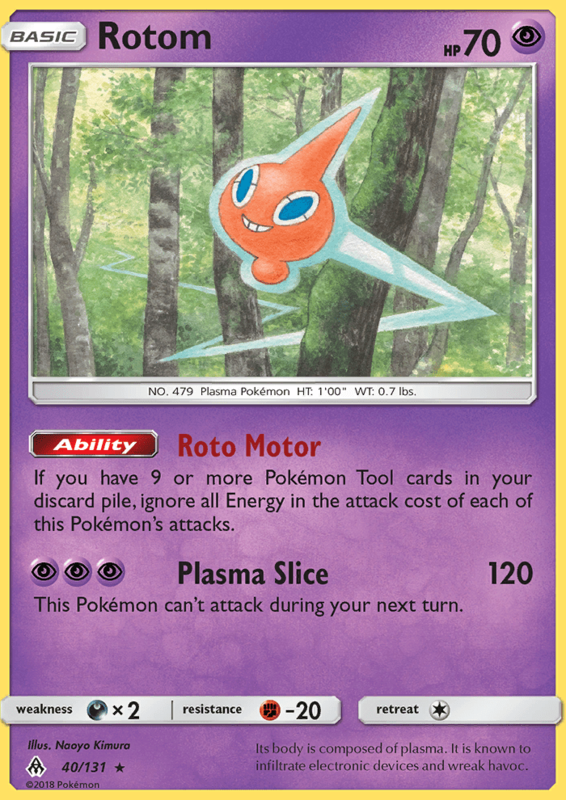 The only interesting thing to talk about with Rotom is that we now have 5/9 of the types in Standard that hit for Weakness in Rotom cards with the Roto Motor Ability. This places us closer to having a viable Rotom deck that primarily hits stuff for Weakness. As of right now, a lot of the major Weaknesses are covered. You can get away without Darkness and Fairy types right now. Metal would be a solid addition with Gardevoir GX, Sylveon GX, and Glaceon GX around. The big missing type is Fighting type which hits Zoroark GX for weakness. I don’t think we can expect any more types to be covered in Rotom cards either, as there are only so many different Rotom they can make cards based upon. Beyond missing types, you can’t use the Weakness strategy against stuff without Weakness, such as Tapu Bulu GX. Additionally, against Ability lock, such as Garbodor BKP and Greninja BKP, you won’t be able to make use of the Roto Motor Ability. Not to mention it’s still very hard to even get 9 Tool cards into the discard pile if you’re not playing Gourgeist. These Rotom cards have too many problems, I hope this is the last one we see printed. Looking back, I rated the Lightning type Rotom too high in the last set. Needing two different cards in play to make use of a tech like this is a little too space intensive for a tech. Removing Resistance will generally be meaningless for most decks in most matchups and even then, it may not be feasible to have bench room for two tech cards to get rid of Resistance. Mind Splash is interesting if you have Uxie in play. You could do 100 damage with a Choice Band, which lets you hit 200 damage against Psychic weak Pokemon, such as Buzzwole GX or Espeon GX, although it can’t OHKO something with higher HP, like Lucario GX. 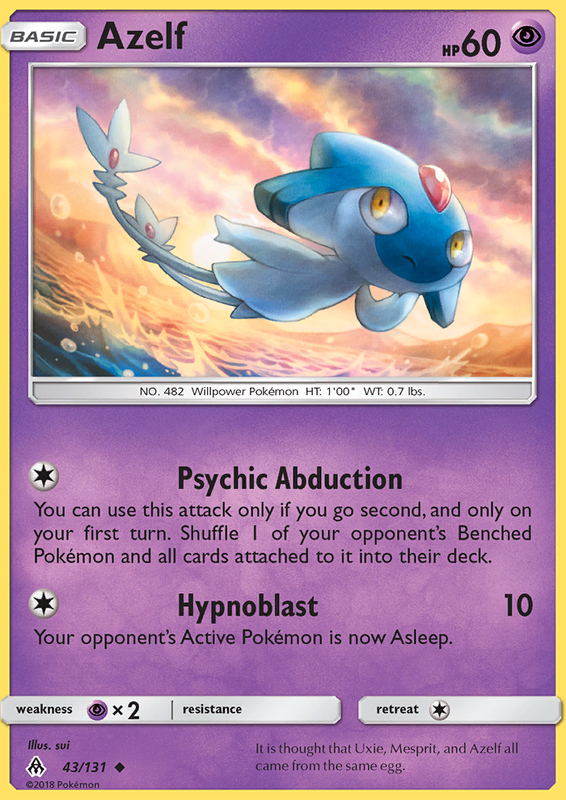 Right now, I think there are too many better options for this role in Mew FCO, Mew EX, and Mewtwo EVO, but in a future format, I think there is some fringe potential for this card to be used as a tech attacker to hit for Psychic weakness. Azelf is a neat little disruption card. Being able to shuffle in one of your opponent’s Benched Pokmeon on the first turn of the game can disrupt an opponent’s setup very well. However, only being able to use it on the first turn of the game when going second makes it far too situational for it to be practical to actually use this as part of a consistent strategy. Hypnoblast is a solid attack to potentially stall a turn, but you don’t throw a card like this into a deck just to have access to attacks this underpowered. 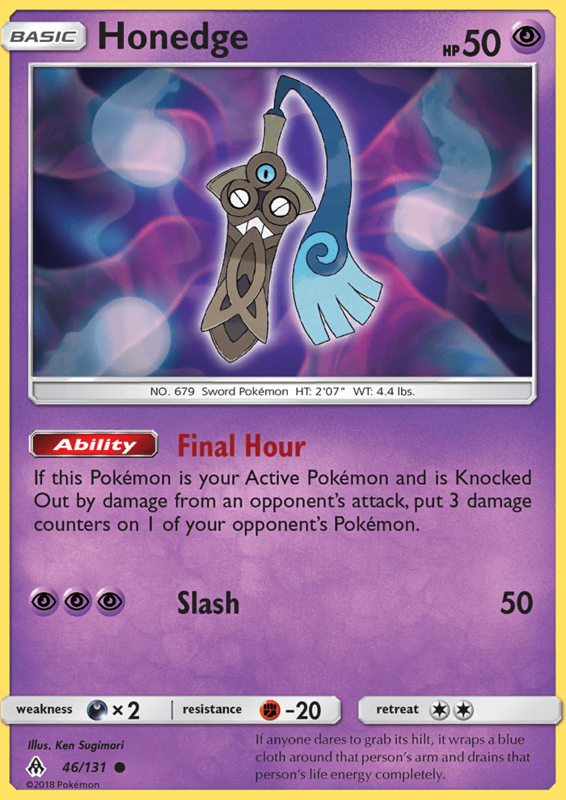 This Honedge should become the default Honedge to include in any Aegislash deck. 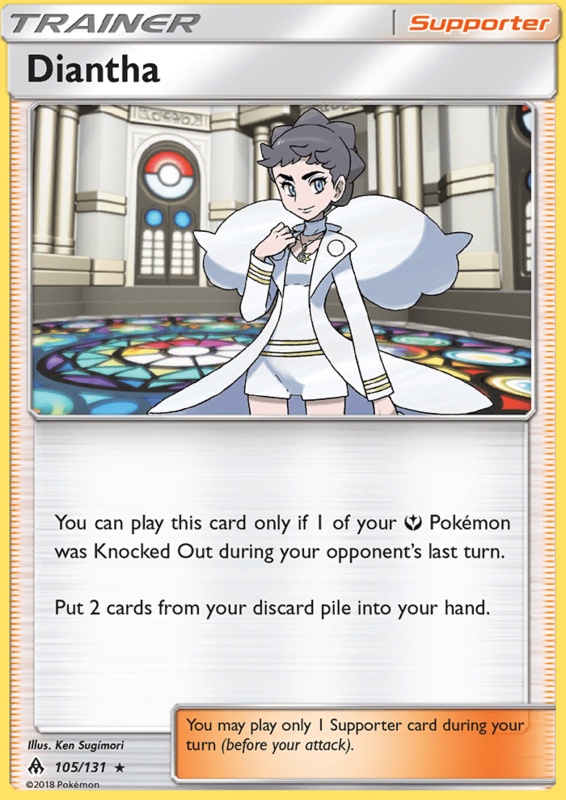 Your opponent being punished for knocking these out early game helps soften the blow from getting one of your pre-evolutions knocked out and being able to put the damage counters on any of your opponent’s Pokemon, not just the attacking Pokemon makes it much more versatile and effective. Now we sit around and wait for an Aegislash worth playing to be released. The last two times this style of Ability was printed on a card it was played to great effect. Eelektrik and its Dynamotor Ability and Bronzong and its Metal Links Ability have both been used to high levels of success, such as Regional Championship wins. With these types of Abilities, players will typically be able accelerate 2-3 extra Energy onto their field every turn. I expect Malamar to follow in those cards’ footsteps, especially with the number of great Psychic Energy attackers it has at its disposal – Necrozma GX, Ultra Necrozma GX, Dawn Wings Necrozma GX, Mewtwo GX, Mew FCO, among other potential attackers. With so many tools in the toolbox, it’s hard to see some combination of these cards not seeing success with Malamar. The one thing to point out with Malamar is that there is less setup help in this format than Eelektrik and Bronzong had. Eelektrik was at its best when players were pairing it with Smeargle or Tropical Beach for extra draw. Bronzong saw its best days after Shaymin EX was released, giving it some extra draw, allowing you to get more Bronzor in play to get things going. However, it’s important to point out that Eelektrik and Bronzong did see success in formats without additional draw as well, they were just at their best when they had it. Something else worth pointing out is with Mysterious Treasure, there is a second card in addition to Ultra Ball that Malamar players can use to setup, which should help its consistency quite a bit. Dragalge is a misfit for this format. There is so much Energy acceleration that an Energy removal attack isn’t super effective right now. Poisoning an opponent’s Pokemon when damaged is a nice bonus, but there is no substance behind Twister an attack to make it worth playing. I think Hoopa is being overlooked as a potential setup Pokemon. Two item cards is a pretty significant amount and can be used to find the right cards you need to setup a deck. Being able to search out Rare Candy in particular could be very useful for getting Stage 2 decks setup. Sableye DEX has shown in the past that two Items can matter a lot in getting a deck setup. That’s not to say Hoopa is comparable to Sableye beyond that, Sableye can be used with greater versatility since it recycles resources while Hoopa searches Items from the deck, and eventually you would run out of stuff to search out from the deck. Psy Bolt is a solid stall attack to have as an extra attack on the card, but nothing special on its own. 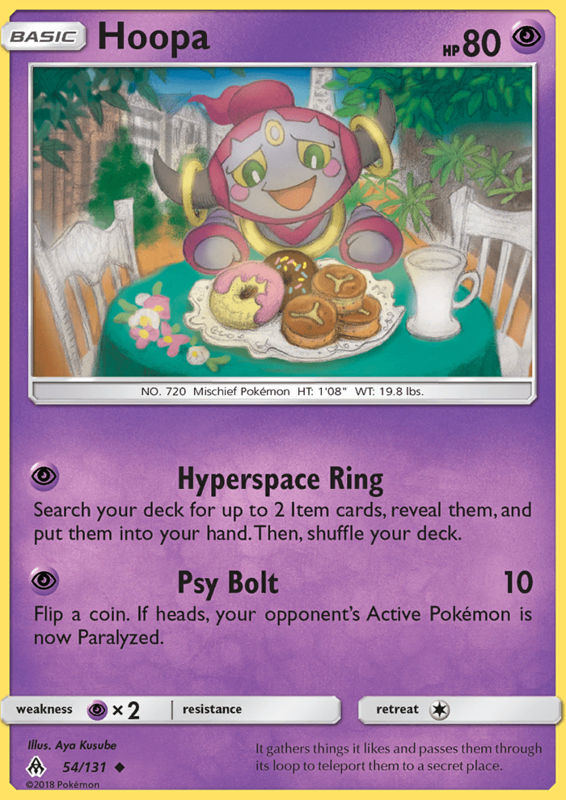 Hoopa is very limited in what its effective role could be as it requires a Psychic Energy to attack, but I think it could be useful for setting up some Psychic decks. Poipole is great for a pre-evolution Pokemon. Knockout Reviver is super solid as you can keep your opponent out of taking prize cards in the early game with it while you setup your main attacker on the bench. 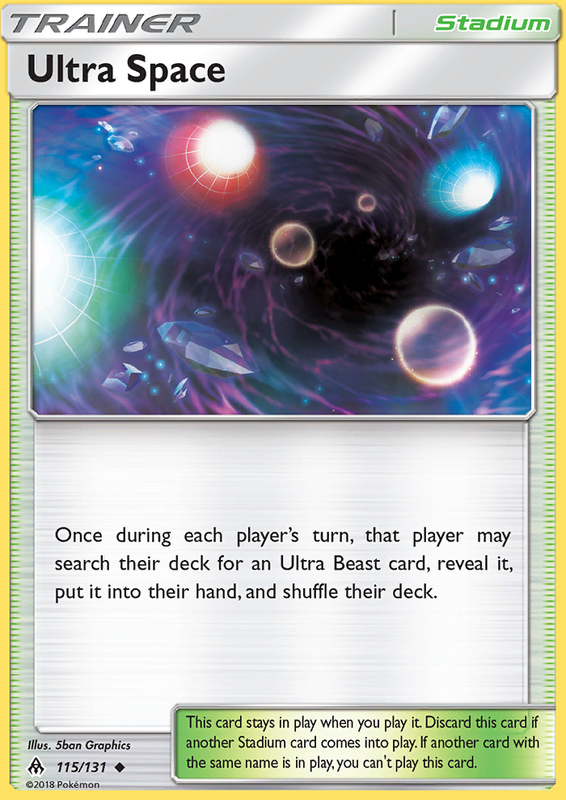 Getting the Ultra Beast designation as a Basic Pokemon is also great as it will allow you take advantage of cards like Beast Ring more effectively in a Naganadel GX deck as you can use it with either part of the evolution line. Naganadel GX has a lot going on, and it’s going to be hard to decipher if all that’s going on can actually be played effectively. First, Beast Raid should be a pretty solid attack. It can attack for 120 damage with a full bench of Ultra Beast, which should 2HKO most things. With a single Energy attack, Naganadel GX is something you could easily build a tank strategy around as you can Max Potion off the damage and just attach another Energy to attack with it. It also has the potential for some OHKO on GX Pokemon. With a Beast Energy and Choice Band you could do up to 180 damage with Beast Raid, which can OHKO something like Tapu Lele GX. Jet Needle seems generally useless as an attack. I’m not sure there are many situations where it will be the better option over Beast Raid, or at least not a significantly better option. Stinger GX is going to be the toughest part of the card to figure out. First, it needs to be figured out how this attack can be used effectively and after that you need to figure out if there is any deck that using such effect is worth using this for. The two main ways to use it are going to be to accelerate a game state or to roll a game state back. You can use it very early on to get the prize count to three to try to finish off a game very quickly. The other way to use it would be to roll prizes back to three when your opponent gets down to one or two prizes remaining. I’m not sold on Stinger GX actually being an effective attack though. My biggest issue with it is that it acts as your attack for the turn, so your opponent gets first shot at taking some prize cards after you use a Stinger GX. The primary situation I would think it would be effective is to roll back prizes to three in a game in which your opponent is running low on resources. I think that Stinger GX isn’t something that decks will be built around, but instead if people are playing Naganadel GX decks it will just be an option that players can use if the right situation develops. This set provides us with some reprints of various cards in the last few sets, now as Fighting types. Being Fighting type actually helps most of these cards out. The primary thing that these cards gain from the switch to Fighting type is access to lots of damage modification. Strong Energy, Diancie Prism Star, Fighting Stadium, and Regirock EX all let these Pokemon boost their damage output. They also can get Energy acceleration from Carbink BREAK now that they’re Fighting type. Torterra’s Giga Drain gains a lot more healing power now that it is Fighting type. With Choice Band, a pair of Strong Energy (maybe powered up by Carbink BREAK), and Diancie Prism Star in play you’re up to 140 damage which is a lot of healing power. Earthquake also can reach OHKO numbers against almost anything in format much easier with the Fighting support. Ultimately, as a Stage 2 and with such high Energy costs, a good Torterra deck is unlikely to be built. As is, without Fighting support, Infernape was hitting for 110 damage (after Burn damage) every turn, which could be raised to 140 damage with a Choice Band, which meant you would typically be 2HKO’ing GX Pokemon. The Fighting support helps you hit a little bit better numbers, and may allow you to finesse your way into a OHKO against the lower HP ones like Tapu Lele GX. Switching to Fighting type didn’t do a ton to help it become more viable as an attacker, but like the Fire one, I think it could be a solid bench sitter for a better attacking Pokemon that burns. The biggest winner from the switch to Fighting type has to be Garchomp. Just getting a Diancie Prism Star into play can have a big effect. Instead of doing 50 damage with Quick Dive, you can do 70 damage to your opponent’s Active Pokemon, which will OHKO most Basic pre-evolution Pokemon, while 50 would not. Royal Blades also becomes more threatening, being able to extend its reach to 250 damage with Diancie Prism Star and a Choice Band in play. Like the Dragon Garchomp however, you still have a problem with figuring out the attack cost. Three Energy is a lot and Fighting doesn’t have great Energy acceleration options that let you stream an attacker. Max Elixir is probably the best you can do and that’s awkward in an evolution deck. Still, the attack damage is right where you would want it and now even better with the switch to Fighting type, but it will need something released that helps it get the extra Fighting Energy into play before it can be used well. Once that’s figured out, I think Garchomp will be good. Who knows, maybe something like the Alolan Marowak in this set could be the partner needed to help Garchomp figure out its Energy problem. 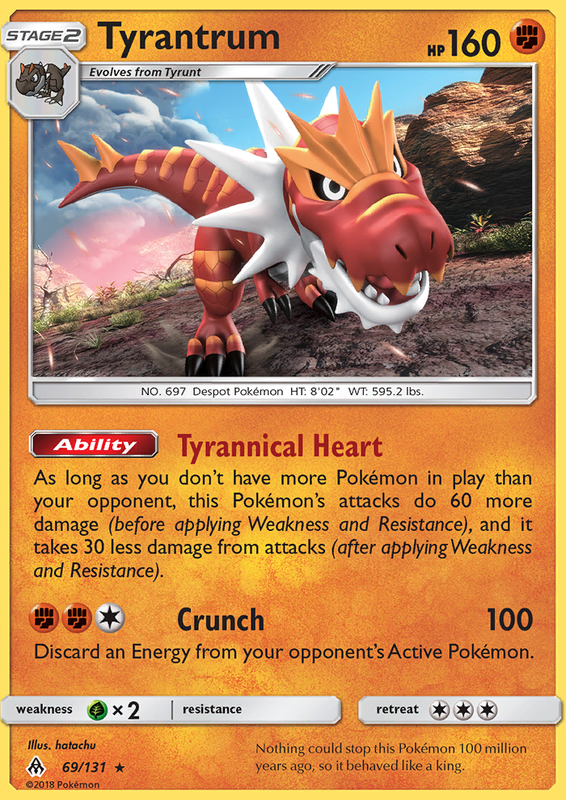 Tyrantrum has too much working against it to be a viable card. First of all, it’s a Stage 2 Pokemon, meaning a lot of resources need to go into setting it up. Then once you get one in play, you need to get three Energy attached to it. Then it only does 100 damage, but you could boost that to 160 damage with its Ability. With Diancie Prism Star and Choice Band you can hit for 220 damage with Crunch if its boosted by Tyranical Heart. However, Tyrannical Heart can be played around fairly easily. A lot of decks can limit their bench size to play around Tyrantrums damage boost. However, I don’t think many players would even bother to try to play around this as it takes so many Energy to attack that it’s probably a rare sight to ever see one of these actually attack. Zygarde GX is one of my favorite cards in the set and it’s one I think is quite good. I think it’s optimally going to be played in a deck built around itself. The first part of the equation is Zygarde GX’s Cell Connector attack. I think because of this attack, it will make more sense to play Fighting Fury Belt with Zygarde GX instead of Choice Band, as FFB can get you up to 60 damage, which is significant when you’re trying to knockout pre-evolutions. Diancie Prism Star gives you another option for boosting damage and that can get you to 70 damage if you get it in play, or 80 damage with a Fighting Fury Belt, which will allow you to knock out pretty much every pre-evolution. 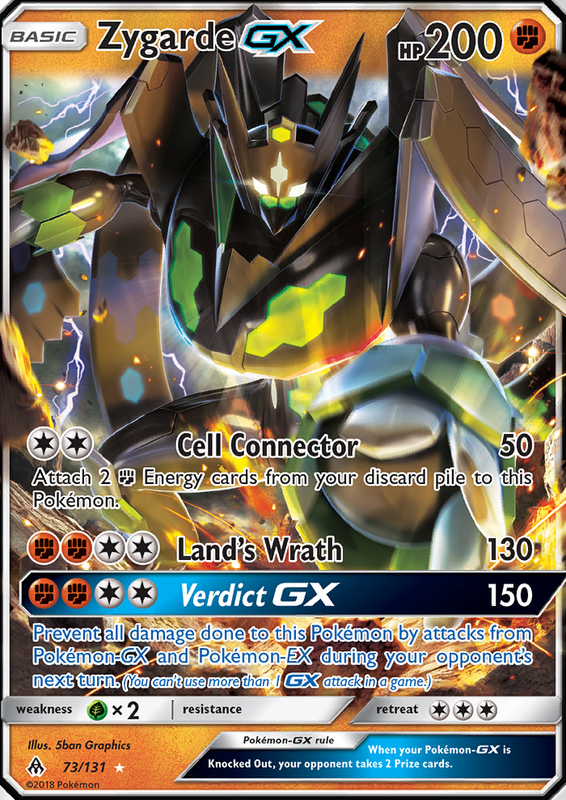 Then if you can get some Fighting energy into the discard pile on the first turn of the game you can use the effect of Cell Connector to get Zygarde GX’s Land’s Wrath and Verdict GX attacks powered up for the next turn. Land’s Wrath is a pretty effective attack when you combo it with Cell Connector. They combine for 180 in base damage, but that can easily be raised up to the 240 range with Diancie Prism Star and Fighting Fury Belt, allowing you to 2HKO most GX Pokemon. 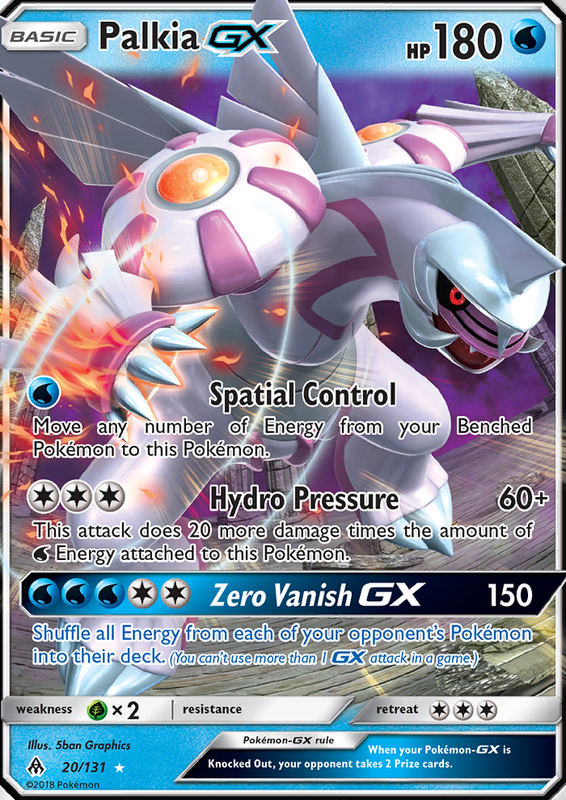 Verdict GX lets you hit for even higher damage numbers, working as a better OHKO attack as a result and then prevents all damage from your opponent’s GX or EX Pokemon during their next turn. You can re-use Zygarde GX’s GX attack again thanks to the Supporter card Bonnie. I don’t think it’s going to be viable to build a Zygarde deck around using Bonnie over and over again throughout a game. Needing to discard a Stadium card makes it somewhat difficult to stream throughout a game. 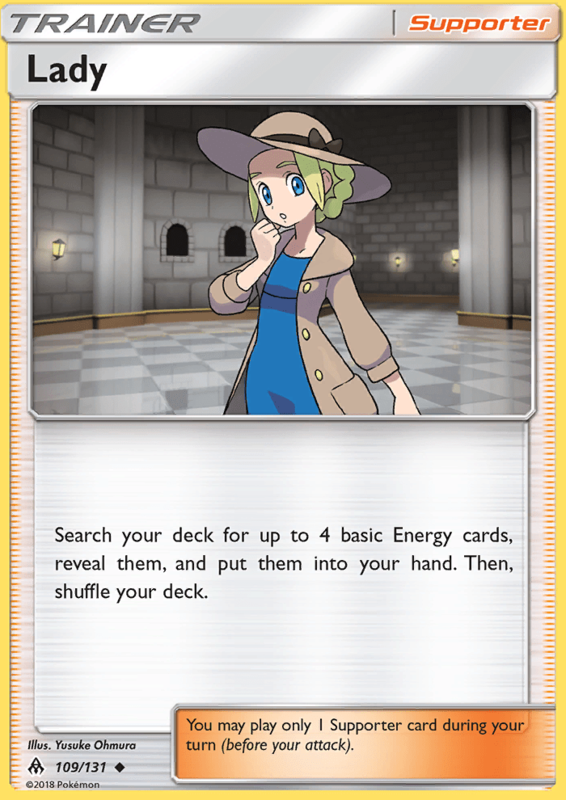 With that said, I think Bonnie does have a place in Zygarde GX decks, but it’s something you play in around a two count and take advantage of a second or third GX attack just in certain game situations. 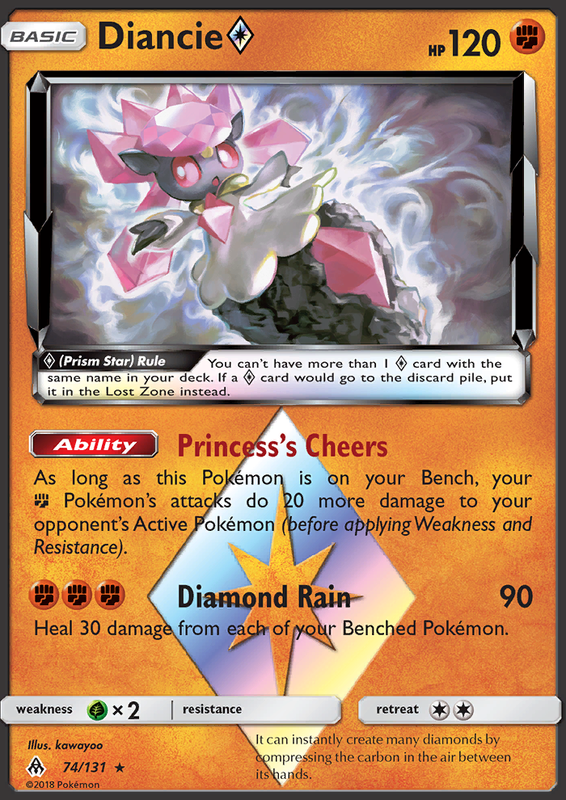 Diancie Prism Star isn’t a very versatile card, but it does its one job very well. Diancie boosts the damage of all of your Fighting Pokemon by +20 damage against the opponent’s Active Pokemon which helps make most Fighting Pokemon much better. It makes it so cards like Zygarde GX and Buzzwole GX have an easier time taking OHKO’s on pre-evolution Pokemon in the early game, while allowing them to pack a harder punch in the late game. It can even be used with a card like Gallade BKT to hit for some better damage numbers. Its attack is too costly to be something you would actually use, but at 120 HP, it has some decent bulkiness to it for a non-GX. It still can be OHKO’d fairly easily, but something like Zoroark GX, for example, would actually need the full bench to take a OHKO, so it’s possible for something like that to whiff the knockout against this if it’s trying to. Baby Buzzwole gives Fighting decks a solid non-GX option. Sledgehammer does enough damage so that it can setup a knockout for something else, while sacrificing itself as a one prize attacker. With Strong Energy and Diancie Prism Star, 70 damage is a very easy number to reach with it. Sledgehammer also comes with the bonus of being able to do 120 damage when your opponent has 4 prize cards remaining. That can easily turn into a OHKO with damage modifiers, so Baby Buzzwole gives you a good option for taking your 3rd and 4th prizes in a game for a low investment cost. 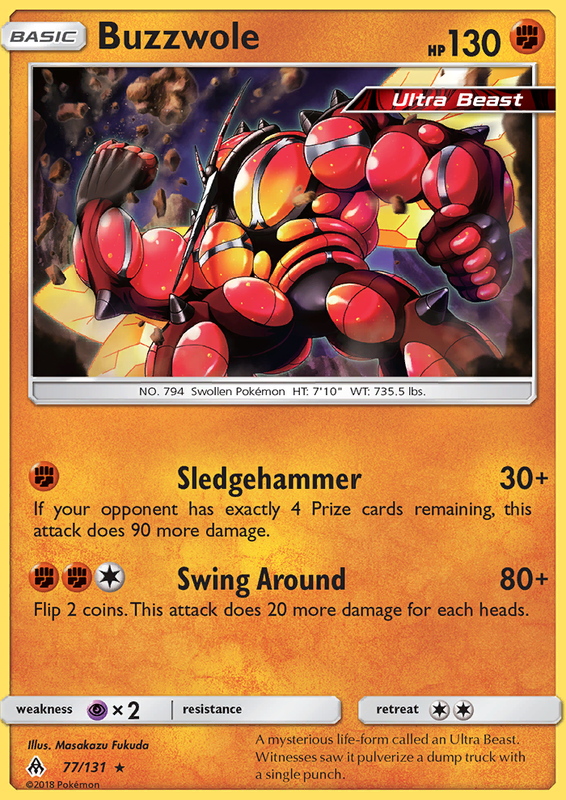 Swing Around isn’t very strong and likely would only be used in a Beast Ring deck, but even then, you would probably want to accelerate to a Buzzwole GX instead in most situations. When I first heard that there would be an Yveltal GX in this set I was super excited to see what they would make for it, as it could potentially revitalize Turbo Darkrai or Yveltal EX decks in Expanded, as well as usher non-Zoroark Dark into Standard format, but this Yveltal GX card is very weak. Absorb Vitality is a very weak chip attack, while Sonic Evil does a very generic 100 damage. The attack could be useful if it gave you a Dark attacker with a Colorless attack cost that could OHKO Dark weak Pokemon for you, but the attack damage isn’t affected by Weakness, so it’s even worthless in that regard. 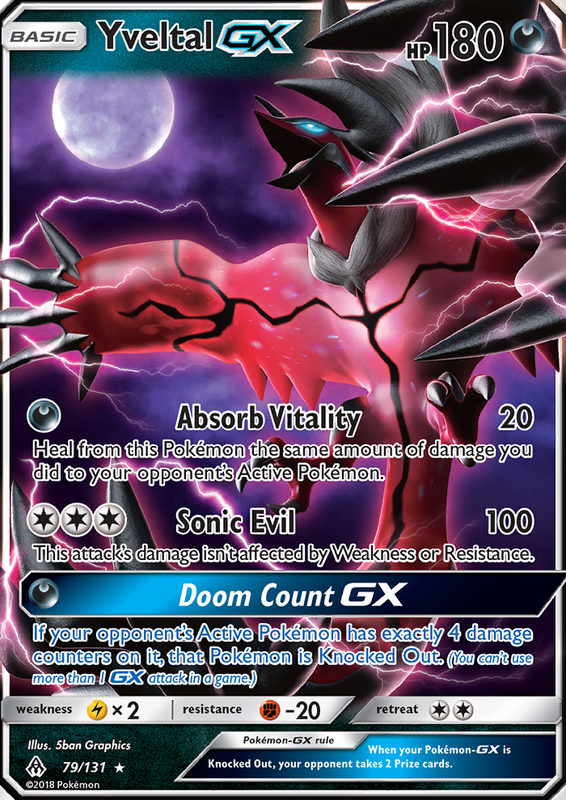 Doom Count GX is solid for a big knockout when your opponent’s Pokemon has 4 damage counters on it, but it’s too specific, so it will likely not find usefulness for any competitive decks. Guzzlord’s attack damage is great for a non-GX, but four Energy is a heavy investment to get it setup, even with Beast Ring, and when you’re discarding 1/6 of your deck when attacking on even prize counts, I think you would probably be discarding important resources too often that you struggle to finish out games consistently because you run out of resources. Empoleon got a Metal type change in this set from its Water typing. Once again, Empoleon offers a chance to be part of a strong deck by being pretty difficult to knockout with its high HP, while potentially being able to OHKO a lot of GX Pokemon, especially against decks that need to fill up their bench. Total Command still has the issue of needing two attachments to get powered up. While Water type Empoleon has Aqua Patch at its disposal, Metal type Empoleon could be paired with Metal type Ability accelerators, such as Metagross GX or Magnezone, or alternatively it could turn to attack based solutions such as Solgaleo Prism Star or Registeel CIN. 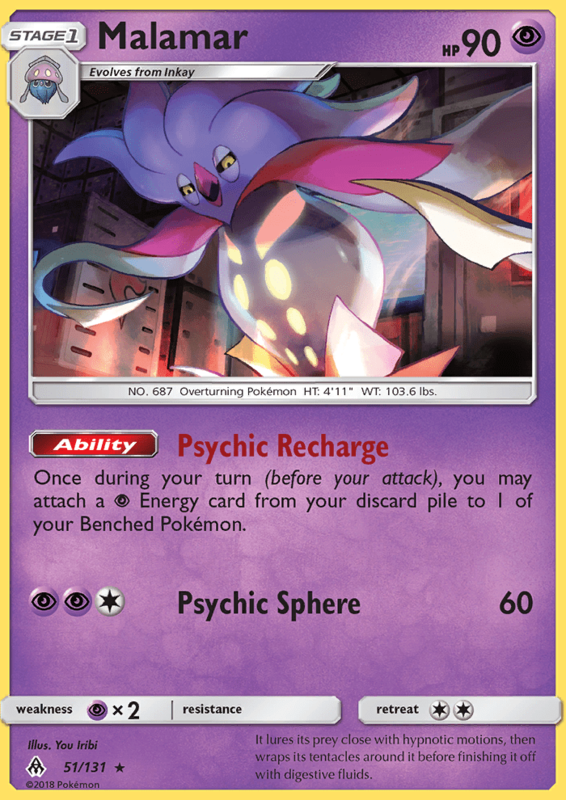 I feel uncomfortable for this cards potential immediately upon release because of the prevalence of Parallel City in the meta game, but when that card rotates this summer, I think cards that scale damage based on the number of Pokemon in play will have better potential. Not much has changed on Dialga GX with its type change from Dragon to Metal. All of the attack costs are the same, so the only things that change are that it can now hit for Metal weakness, it’s now weak to Fire, and has a resistance to Psychic. Dialga GX didn’t really have much of an impact in this last format, but part of that is because Magnezone didn’t find a strong hold on the meta game. 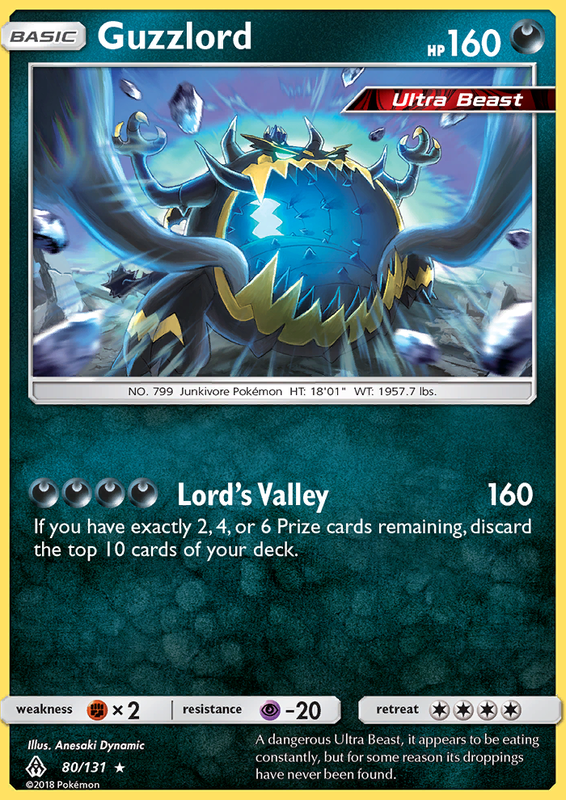 It came out in big numbers in Collinsville, but with a high amount of Garbodor BKP in decks at that Regional and their success, it ended up falling out of favor with players. Magnezone is still a strong card, and I think Overclock and Timeless GX could provide value to Magnezone decks in the future. The biggest question is does Magnezone have a future in the meta? With the release of Malamar in this set, is there anything Magnezone does better than Malamar with Necrozma GX or Ultra Necrozma GX does? 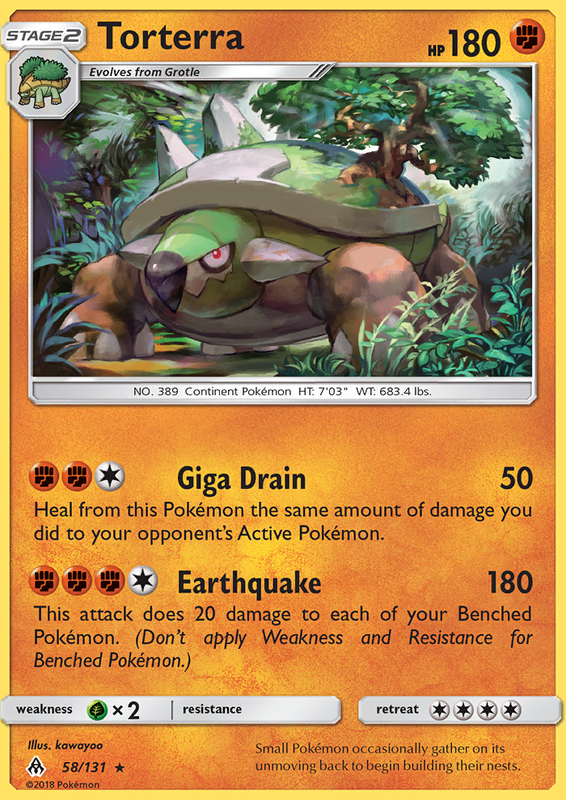 It’s hard to tell, but it’s worth nothing that Blastoise decks saw success in the same formats that Rayquaza EX/Eelektrik decks did, so the rain dance style decks may be on more equal footing with these decks than it would first appear, but it’s also worth noting that Blastoise could rely on using Tropical Beach to get setup back then, while Magnezone can’t. 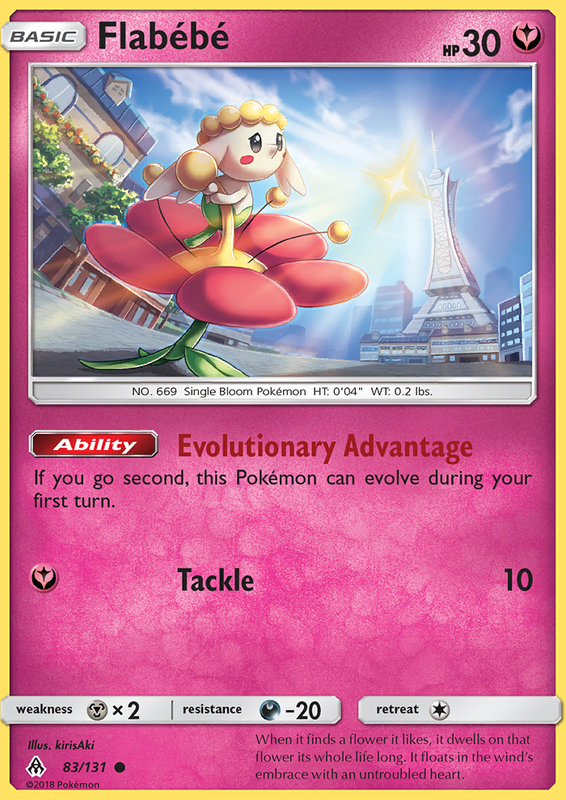 If you’re playing a Florges deck, this is the Flabebe you will want to be playing going forward. Being able to evolve going first will allow you to setup your field so that you get into your Stage 2 on the second turn of the game consistently. The most interesting use of this would probably be for Florges BKT, whose Calming Aroma Ability reduces that attack cost of your Fairy Pokemon by [Y] for each Florges you have in play. With the help of Flabebe’s Evolutionary Advantage Ability, you should have an easier time getting into Florges than you would most Stage 2 Pokemon. However, I don’t think it’s worth it to play a Stage 2 for a 50% probability to put an Item back on top of your deck. If the card went into your hand, I think it would have a shot at worth being played, but with it only going back on top of your deck, you would have to use some other card to actually draw it, making it too much effort for the effect. 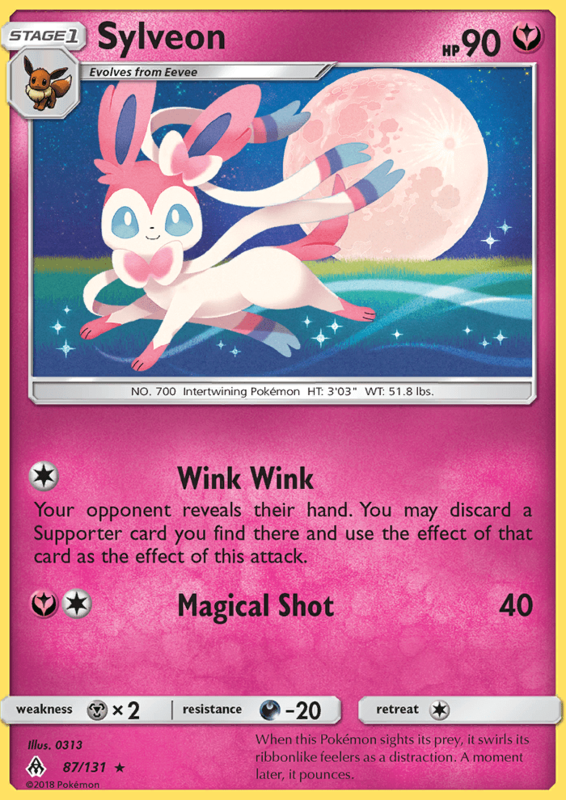 Sylveon’s Wink Wink attack seems like a vicious attack that decks utilizing Sylveon GX, or even any of the other Eveelutions can use. Discarding a Supporter card is very strong, and if you strip your opponent’s only draw Supporter card from their hand, they may just dead draw their way out of the game. 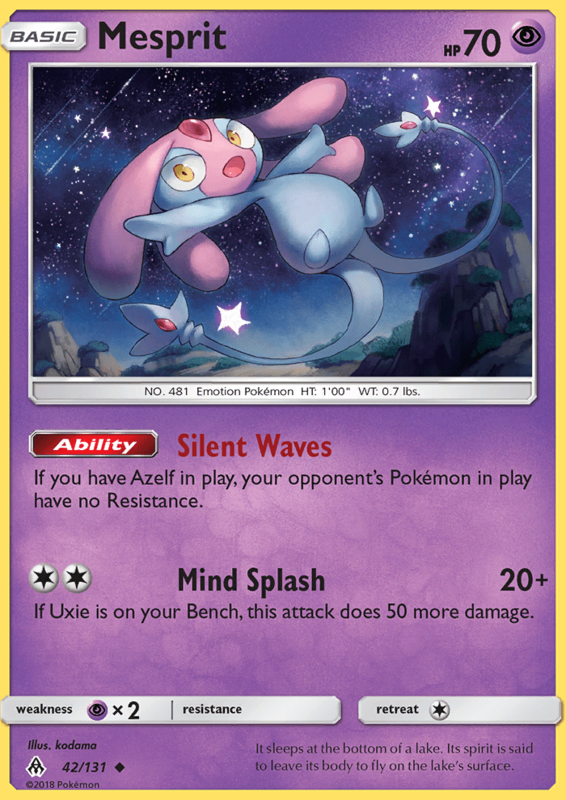 While Sylveon can be played alongside any Eeveelution because of its Colorless attack cost, it would be best with Sylveon GX since you can use Fairy Energy to use Eevee’s Energy Evolution Ability to evolve into it on your first turn of the game. The early turns of the game can be very fragile, so if you remove your opponent’s sole Supporter right away, you will be in good shape to pull far ahead in your setup compared to theirs. For the first time, Xerneas GX can look over at Yveltal GX and say that the Xerneas card they made is clearly superior to the Yveltal card that they made. With that said, this Xerneas still isn’t anything special. 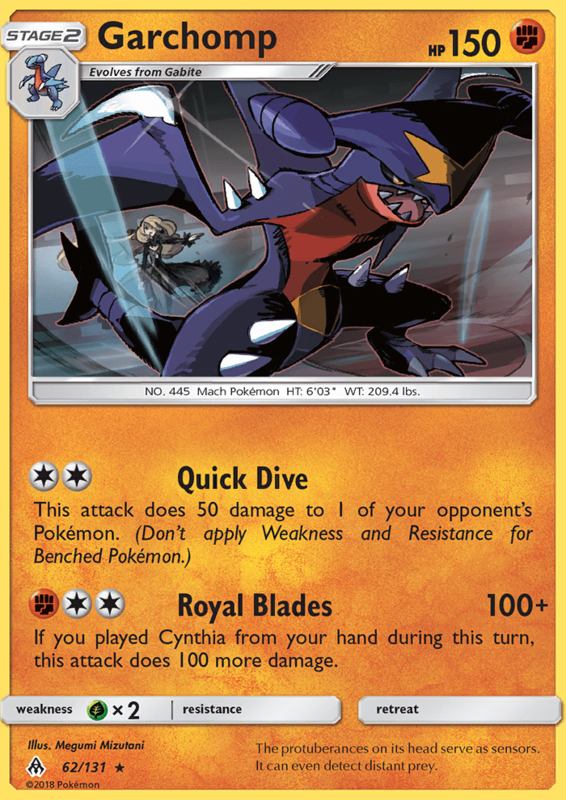 Overrun is a solid chip attack, as it can setup damage on both the active Pokemon and a bench Pokemon, but it’s still weaker than something like Buzzwole GX’s Jet Punch. Aurora Horns does a solid 120 damage, which will 2HKO most Pokemon, but for three Energy, it’s not going to be something worth setting up. 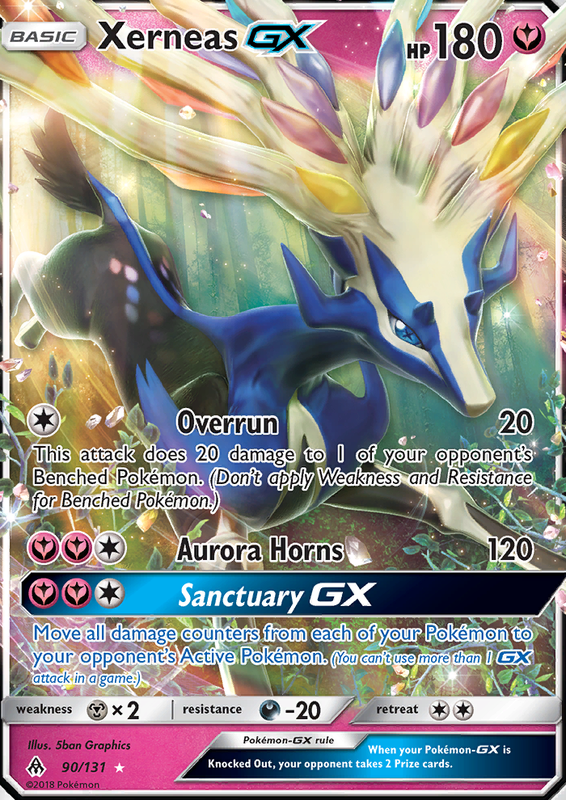 Sanctuary GX is a good GX attack for clearing damage off a field, but it’s costly to get get setup, and it suffers from only being useful in specific situations. Goomy is an excellent pre-evolution that will help slow down your opponent’s early game onslaught of your pre-evolutions. This would require something like Buzzwole GX to need two Energy to use Jet Punch, or Pokemon like Tapu Lele GX or Zoroark GX needing three Energy for the knockout. None of the Goodra or Sliggoo that Pokemon has made are good enough to be played competitively, but this Goomy is worth picking up in case they release a better Goodra in the future. 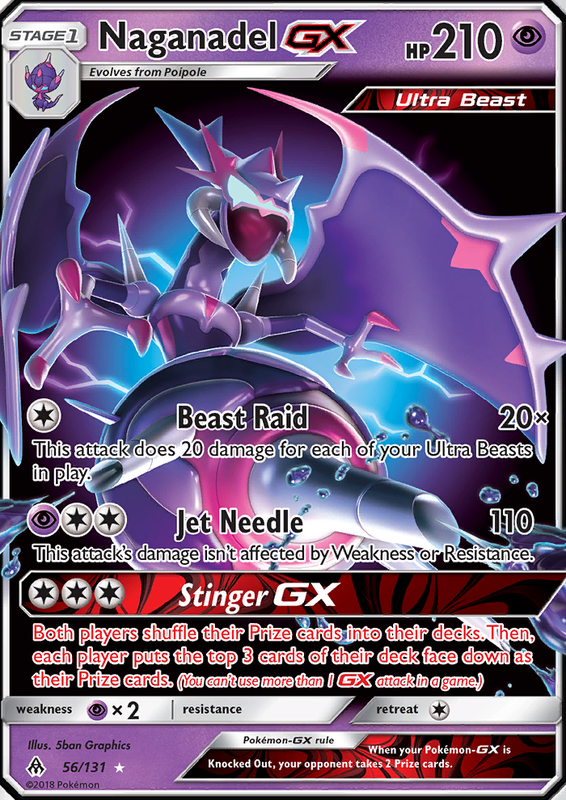 Ultra Necrozma GX provides a strong partner for Malamar as long as both cards remain in format. For three Energy, you would be doing 180 damage (which can be boosted to 210 with Choice Band), and then for four Energy, you would be doing 260 damage, which is going to OHKO everything in the game. With Malamar to power it up, getting that much Energy on it from turn to turn is not too difficult to use. There will definitely be some early debate on what’s the better Pokemon to use alongside Malamar, Necrozma GX from Burning Shadows or Ultra Necrozma GX from this set. For three Energy, you will get 190 damage out of Necrozma GX, versus only 180 from Ultra Necrozma GX. For four Energy, you will get 250 out of Necrozma GX versus 260 out of Ultra Necrozma GX. I would say Necrozma GX is going to be the better play in a vacuum as it’s easier to get it setup when you only have to worry about one Energy type versus the two Energy types needed for Ultra Necrozma GX. That’s not to say there aren’t advantages to Ultra Necrozma GX. Fairy Weakness is probably better than Psychic weakness. Psychic weakness leaves Necrozma GX vulnerable to Garbodor GRI as well as non-GX Psychic attackers in the Malamar mirror match. Other small advantages of Ultra Necrozma GX is that it has 10 more HP and it can utilize Beast Energy for a damage boost. Sky-Scorching Light GX is a solid attack option. It can help you finish off Pokemon you didn’t quite have enough Energy to OHKO in the early game, or stuff you attacked with your weaker attackers, and it also can be used to knock out pre-evolution Pokemon if your opponent is trying to get more evolutions setup in the late game. This can be played around if your opponent recognizes the threat, but just the threat of the attack is doing something for you by preventing your opponent from seeking to get setup further. 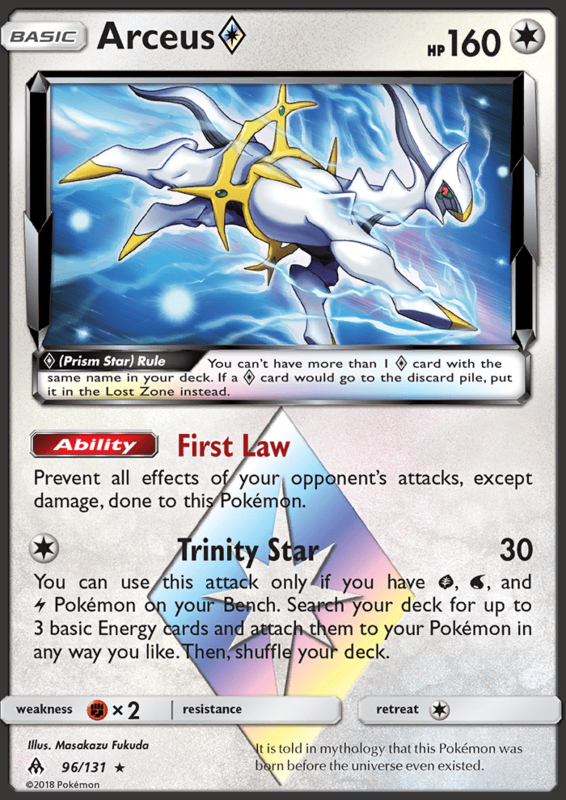 Arceus Prism Star is a pretty cool setup card. Being able to accelerate three Energy off of a single attack is very powerful and with 160 HP, you will probably be able to get multiple attacks off with it, accelerating a lot of Energy onto your field. Unfortunately, it’s only going to be able to be used in very specific decks and there also isn’t a Basic dual type that helps fulfill any two of the types. 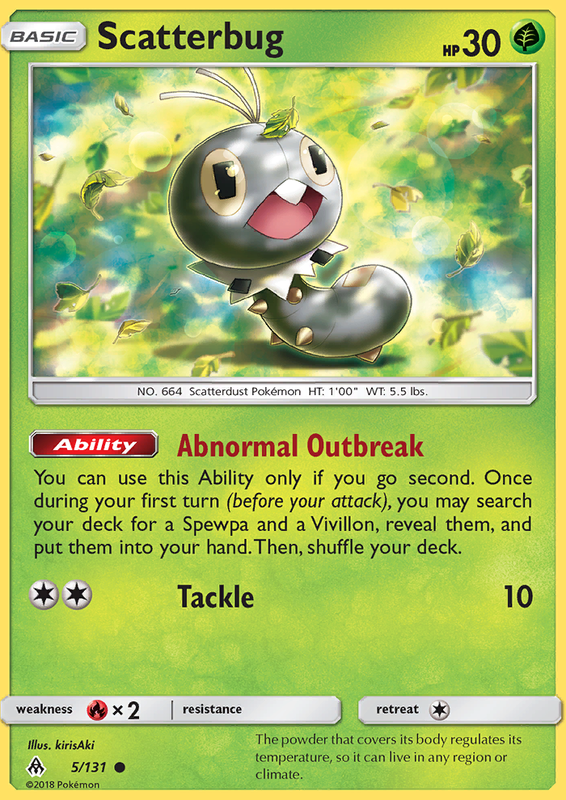 I could see a deck like Vikabulu (with Octillery) being able to utilize this card in some situations, or maybe something like Rainbow Road to re-accelerate Energy in the mid game (Rainbow Road typically fulfills all these types between Galvantula and Volcanion EX). Even a deck like Zoroark GX/Golisopod GX (with the Golisopod GX line/Tapu Koko) has two of the types fulfilled, so it’s only a Water type away from being able to run this card if it wants to. First Law is a nice little added bonus that can prevent annoying little attacks like Bubble from affecting you. Arceus is going to be very difficult to find a deck to use it in, but once you do find a deck that can utilize it well, its Energy acceleration is super strong. Noibat would be played for its Destructive Sound attack. 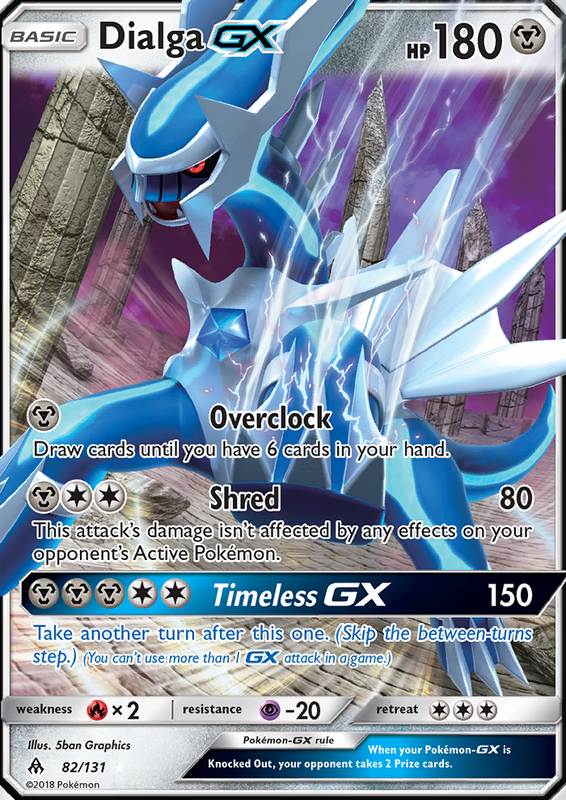 It could be a neat tech that is used to strip a deck like Zoroark GX of all of its Item resources when it grows its hand large, limiting the resources it has to finish out a game by removing cards like Puzzle of Time from play. It could also potentially be played alongside Garbodor GRI to get Item cards in the discard pile to power Trashalanche. 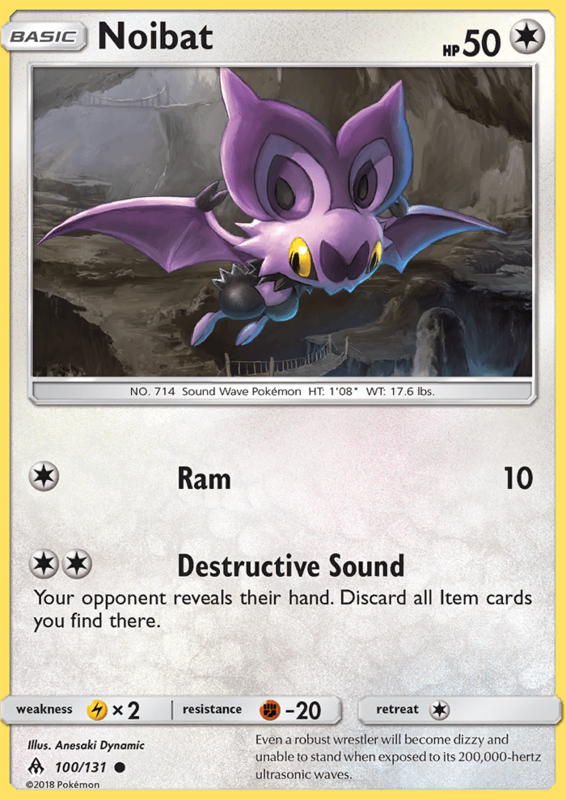 Noibat sounds like it could be a solid tech card in theory, but these types of situational cards tend not to see much play, even when the effect is interesting like this cards is. Crasher Wake has a powerful effect, but having two Water Energy as well as this card in hand at the same time is going to be very inconsistent, so only decks built around this card will be able to use this successfully. 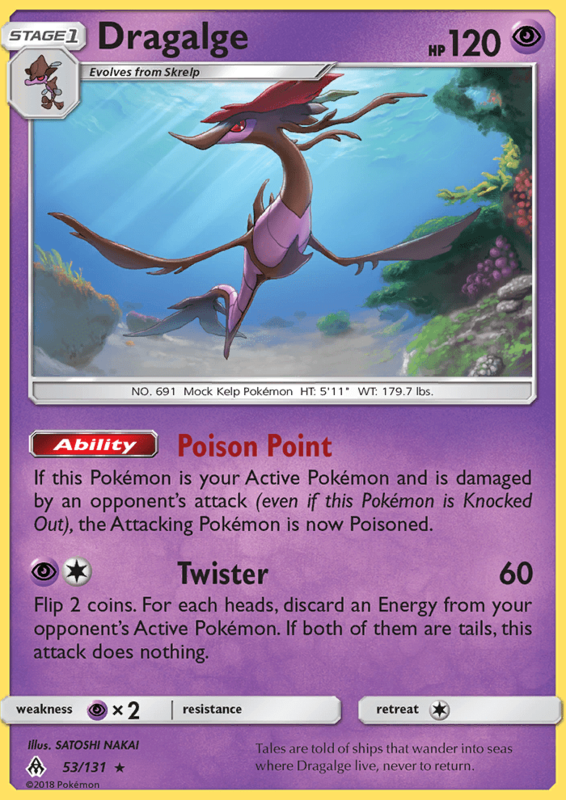 It would work well in any deck with Starmie EVO to get back Water Energy (such as Greninja BREAK decks) and it could be a solid option in Expanded decks where VS Seeker gives you more access to it throughout a game. Something like Archie’s Blastoise might want to use this as a 1-of. It’s pretty common for that deck to have two Water Energy in hand at the same time, although I think that deck may face the issue of not necessarily wanting specific cards all the time and instead just wanting to see as many resources as possible, so this might not be a good fit. While difficult to use, the effect is powerful, so if you find a deck that can use this effectively it could be a powerful asset. Diantha will most likely be an automatic inclusion in any Expanded Fairy deck as you can access it with VS Seeker to time it when you want it. In Standard it becomes more difficult to play as it will become more difficult to find it when you need it. It would work better in a non-GX Fairy deck, such as Rainbow Road or Xerneas BREAK compared to something like Gardevoir GX as you would have more turns that this card is able to be played. Diantha certainly would have been a welcome inclusion in a deck like Rainbow Road earlier in the season, giving you a means to get back cards like Max Elixir to have more shots at accelerating Energy. Lady is an upgraded version of the old Supporter card Cilan, now rendering that card useless in the Expanded format. Lady really isn’t worth playing at the current moment. Very few decks can properly make use of four Energy cards in a single turn, and for the decks that can, using Professors’ Letter, and Item that still allows you to play some other Supporter for your turn, will typically be an effective enough option for getting the Energy you need while still letting you play a better Supporter card. 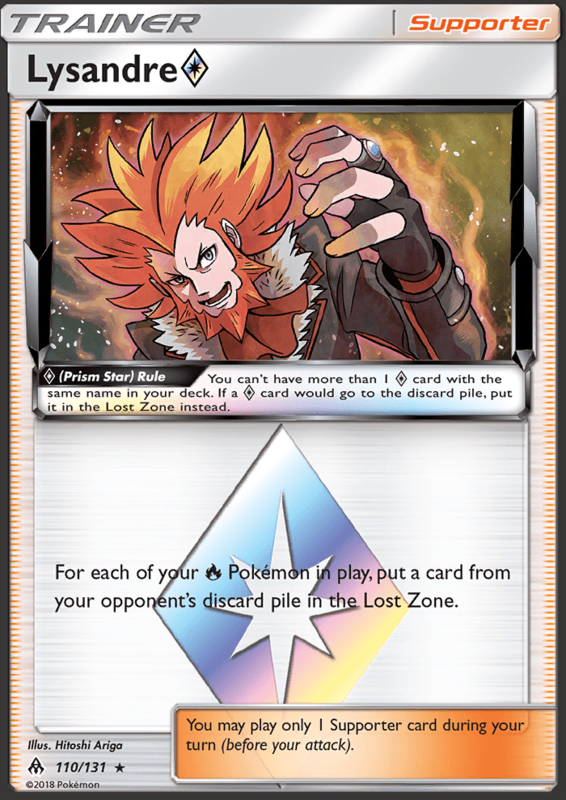 Lysandre Prism Star gives Fire decks a powerful disruption option, being able to attack the discard pile. This could be useful in a number of different scenarios. In the Expanded format, it has the potential to give Fire decks an edge over some of the most toxic decks in format. Against Night March, for example, you could put the Night March players Night March Pokemon into the Lost Zone, limiting their damage output. Against a deck like Zoroark GX, you can put their Exeggcute or key cards like Hex Maniac into the Lost Zone. In Standard, I think it will be a little less effective, but it still has its uses. You could use it against Puzzle of Time decks to target key resources and it can even be useful against something like a Malamar deck by putting their Basic Psychic Energy into the Lost Zone. Being able to draw up to 6 cards while maintaining your hand is very powerful, but as of right now, I just don’t see this type of card being consistent enough. 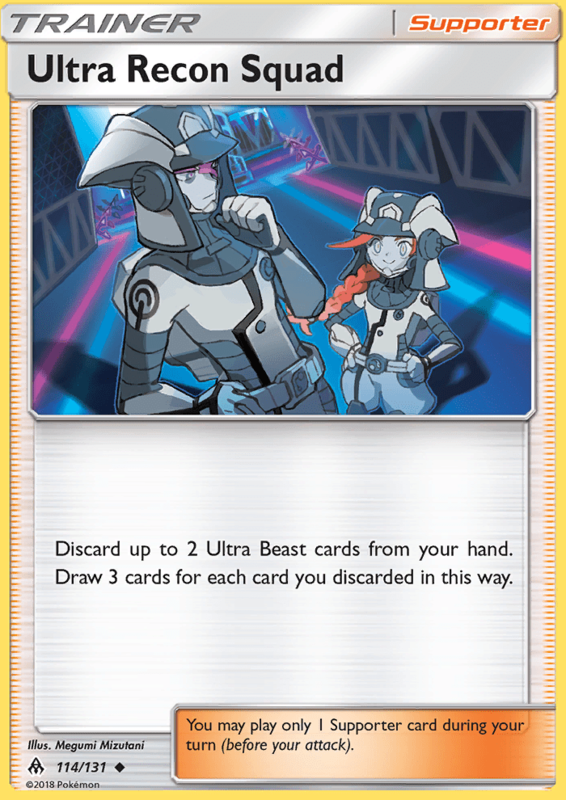 I don’t foresee many decks that have so many excess Ultra Beast Pokemon that they can make use of it. The effect of the Supporter is very good, but the requirements to fulfill it are too rare that this card probably won’t see much play as barely anything will be able to meet the requirement. Beast Ring is one of the most powerful Energy Acceleration effects that we’ve received on an Item card. With most of the Ultra Beast Pokemon, such as Buzzwole GX and Dawn Wings Necrozma GX, having three Energy for their attack cost, a single Beast Ring can allow you to power up such Pokemon’s attacks off your attachment for turn and a single Beast Ring. The nice thing about Beast Ring compared to other cards, such as Max Elixir, is that it is automatic and you don’t have a chance of whiffing it. As long as you have the Energy in your deck, it will be successful if the conditions required for it can be met. As far as its requirement goes, with the format being so heavily OHKO based right now, you will typically only have a 1, sometimes 2 turn window to take advantage of the card. While this isn’t a big window, it’s fine as the impact of the card will have lasting effects beyond the turn you used it. The card is, however, somewhat inconsistent, so it can be difficult to find it when you want to, and since it’s only effective at certain points of the game, it can be a dead card you draw into in the early or late stages of the game. With all of this said, it’s pretty clear that it will be easiest to play this card alongside Zoroark GX (sigh). Thanks to the massive hand sizes Trade can provide you with, it will be easier to find the Beast Ring on the turns you will want it, and then with Trade it will also be easier to thin these out of the deck when they’re no longer needed. Being able to utilize this along with a non-GX attacker will also be something worth pursuit. If you force your opponent to have to knockout a non-GX in the mid game, that can be used to help you get extra turns in which Beast Ring can be played. 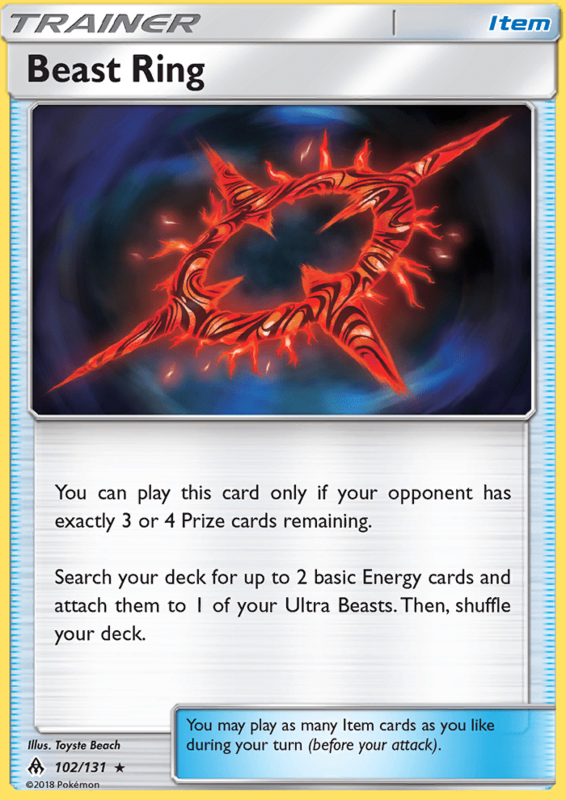 Beast Ring is a somewhat inconsistent card, but it’s still such a powerful form of Energy acceleration that it should do very well and help make a variety of Ultra Beasts very viable during its lifespan. Eneporter could be an interesting option for decks that scale damage based on the amount of Energy on the Defending Pokemon. 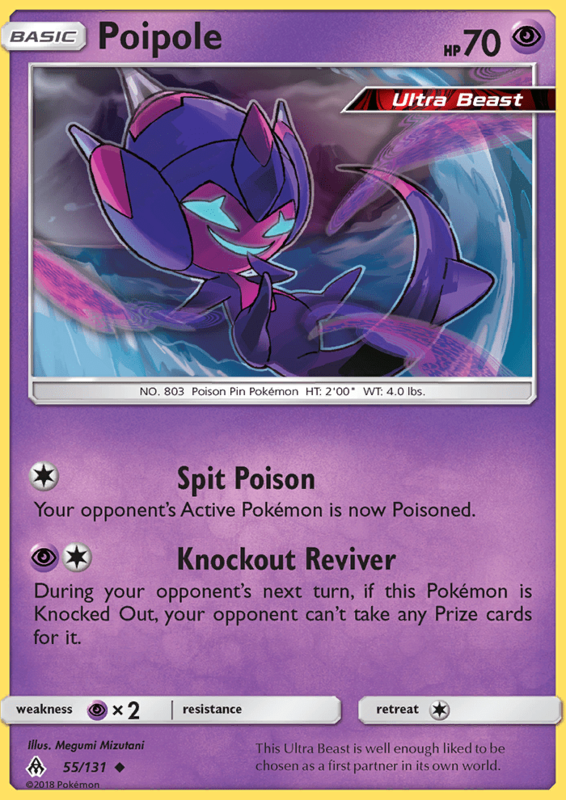 You can use Eneporter to move a Special Energy from a benched Pokemon to the Active Pokemon in a deck such as Espeon GX/Garbodor to increase the amount of damage that you do with Espeon GX’s Psychic attack, while also removing an Energy from something else that your opponent is trying to setup. In most other instances, I think Enhanced Hammer will be better, as it simply removes the Energy from the field. If you try playing Eneporter in the Enhanced Hammer role in some random decks you may find yourself in a situation where the opponent has nothing in play that is useless to move Energy onto. Mysterious Treasure is a big gain for any Psychic or Dragon type deck. It gives these decks an extra search card and it comes with a softer discard cost of one compared to Ultra Ball’s two. 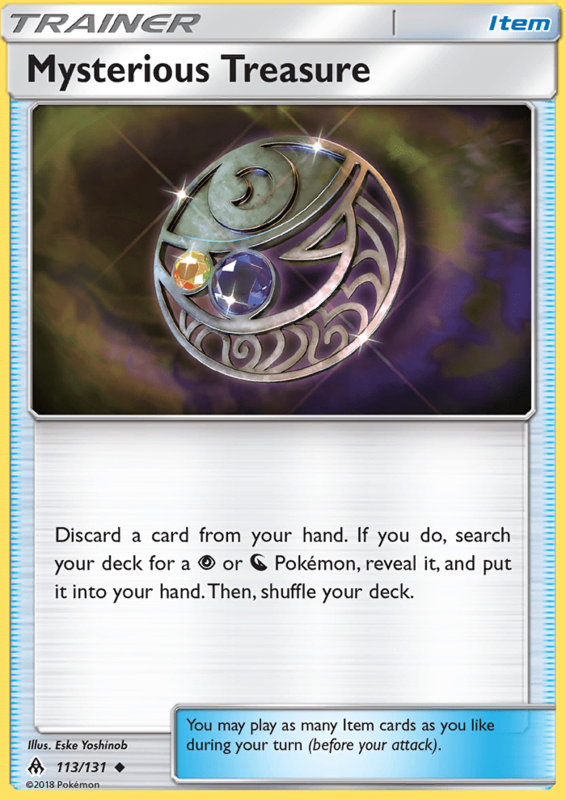 This makes it so that when you play a Mysterious Treasure, you’re better able to hold onto valuable resources in your hand, while with Ultra Ball, sometimes you are forced to make some very uncomfortable discards. This will really help Psychic and Dragon decks become super consistent as they now have up to eight very good Item based search cards available to them between this card and Ultra Ball. It will be especially good in Malamar variants from the get go as it also aides in your quest to discard Psychic Energy to accelerate with Malamar’s Psychic Recharge. 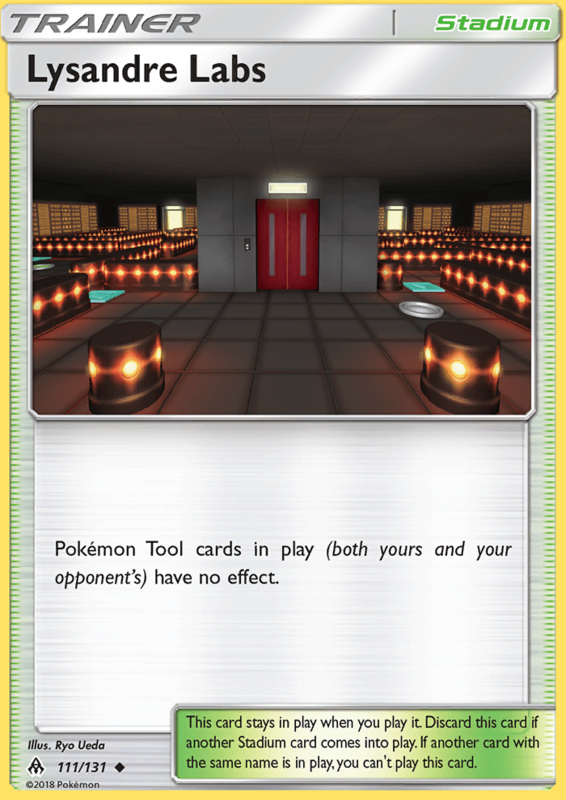 I can’t see Metal Frying Pan seeing too much play upon release, as it is too easy to discard Tool cards in Standard right now with the high amount of Field Blowers being played, but I think it can definitely play a role in Metal decks in the future, possibly in an Ultra Prism-on format where Field Blower may no longer be legal. 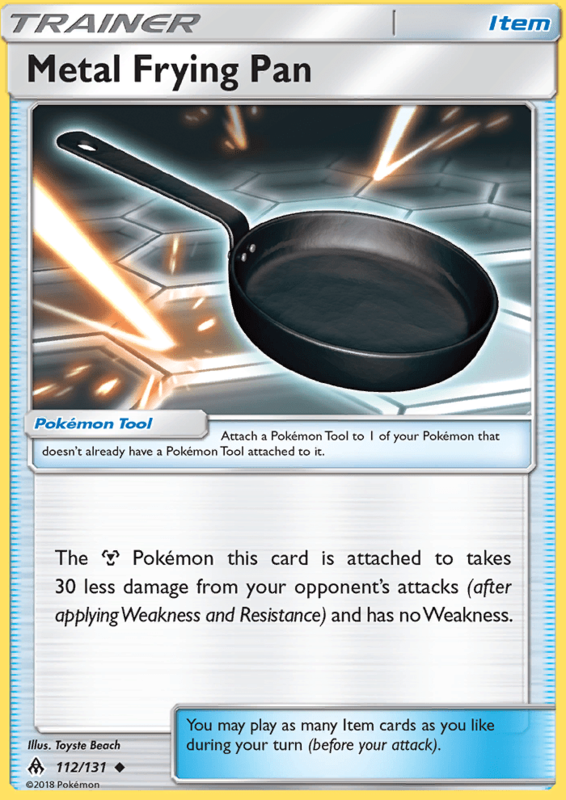 Similar cards, such as Eviolite and Assault Vest have had success in previous formats, so it’s not too hard to see the potential for Metal Frying Pan helping to make a Metal deck viable in the future by making the opponent use extra attacks to get knockouts. Building on the thoughts presented in Metal Frying Pan’s section, I think it’s definitely possible that Lysandre Labs becomes the new form of Tool hate if Field Blower is to rotate out in 2019. The potential for this card is high, as so many decks are reliant on their Tool cards to execute their strategy, or to hit the right damage numbers and this Stadium will have the potential to take away all of those powerful Tool effects. I don’t think this is too good right now with so much Stadium removal between Field Blower and other Stadium cards being played in decks, but in the future, if the only way to remove it from play is through an attack or counter Stadiums, then I think this will have an easier time of sticking in play, making it a better card. Ultra Space is similar in effect to Brooklet Hill, except this is for Ultra Beast. 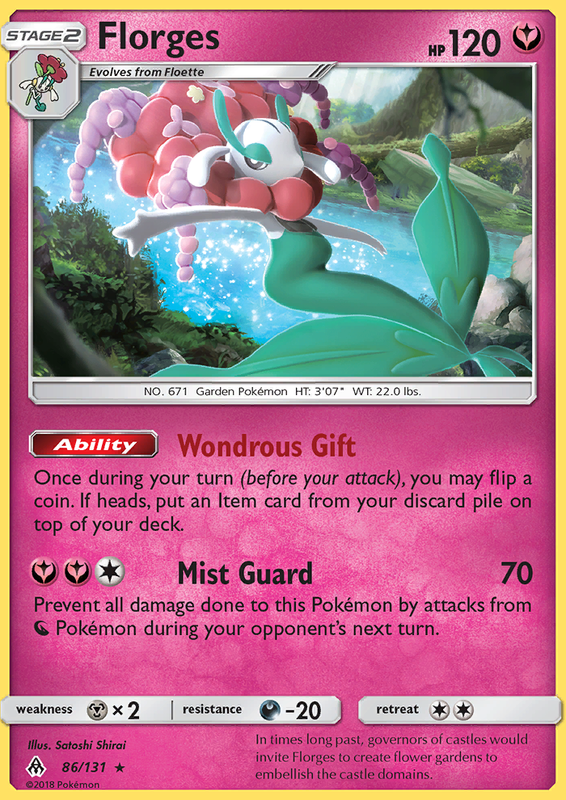 I would venture to guess that this card sees some play in Ultra Beast decks, but doesn’t end up nearly as included in these decks as Brooklet Hill ends up being in Fighting and Water decks. The biggest issue this card will have is that it only targets Ultra Beasts, and most decks with Ultra Beasts right now are only partially made up of Ultra Beasts, with a bunch of support from non-Ultra Beast Pokemon around them. The less focused on Ultra Beasts a deck is, the less value you would be able to get out of Ultra Space making it most likely not worth running in most decks. 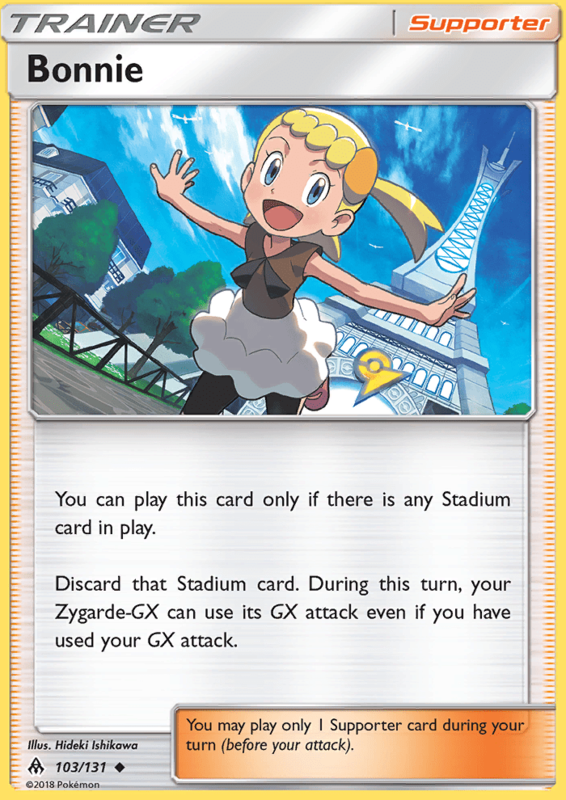 This is different from a card like Brooklet Hill, as in most instances, if you’re playing a Water deck or Fighting deck, almost the entire deck will be of that type, you that Stadium will allow you to search for pretty much every Basic in your deck, while Ultra Space will likely be leaving out most of your Pokemon in most decks. 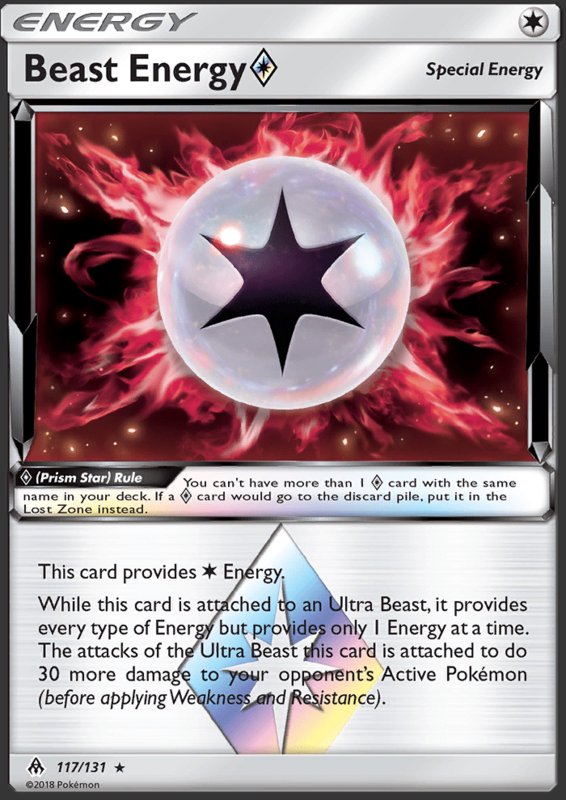 Beast Energy is going to be a good inclusion in the majority of Ultra Beast decks. It’s a Rainbow Energy for Ultra Beast, so in an Ultra Beast deck it will work fine on anything you attach it to. The +30 damage that you get from the effect also is big and can give you an option to hit for more damage and potentially pull off otherwise impossible knockouts to swing momentum in a game. The only place where you might not want to play this in a deck with Ultra Beasts is when you have a bunch of alternate attackers you rely on and who you can’t afford to not be able t o power up if Beast Energy is the only Energy you have in hand. With this, we get the final Blend Energy type with Fighting, Darkness, and Fairy Energy. 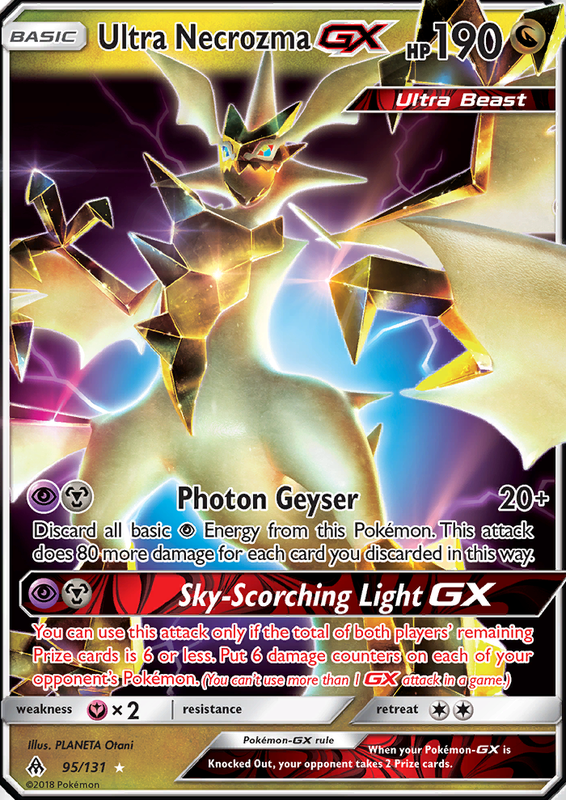 As said for the other two, this card is marginally better than Rainbow Energy when you can use it as it doesn’t place the damage counter on your Pokemon, but in turn it is only useful in a deck playing at least one of those types.